You can compare this plan with 2013 and 2012 by clicking on the year. 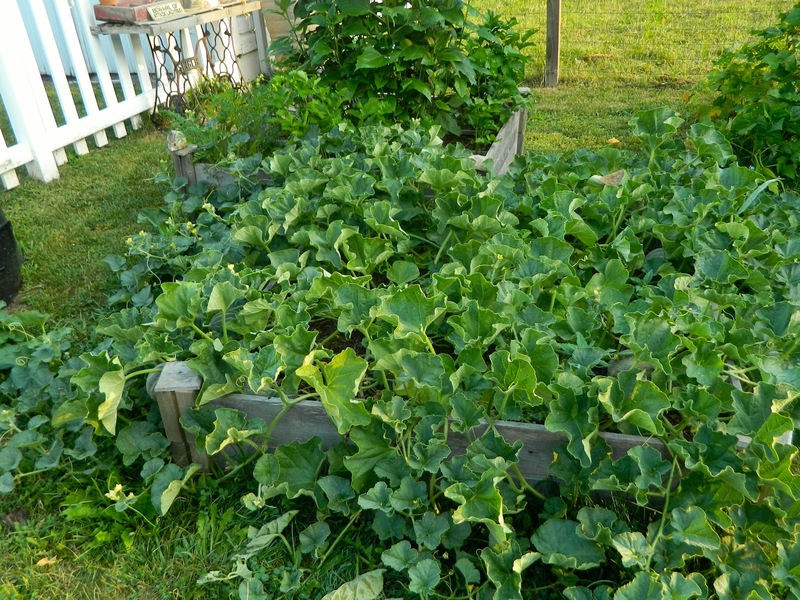 The past postings describe my vegetable garden in detail and explain the rotation method I use. 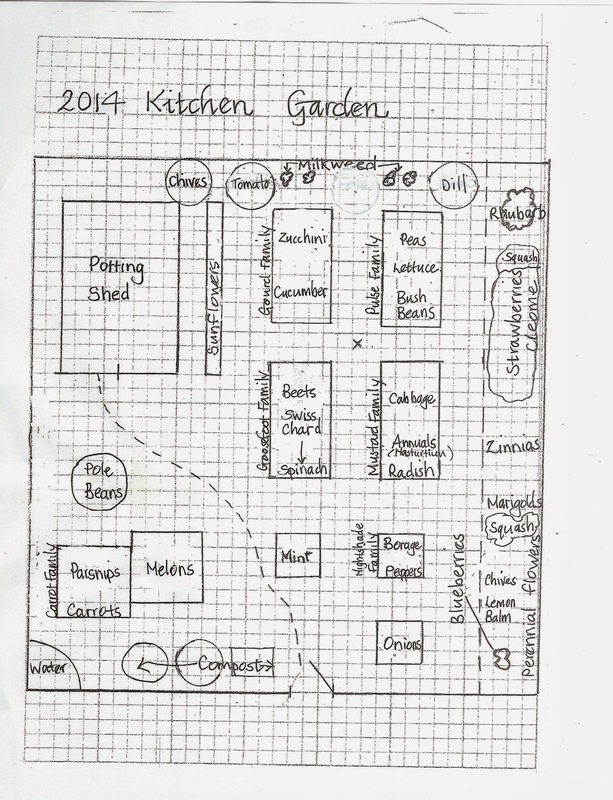 My garden is a combination of direct sowing and starting plants indoors from seed. 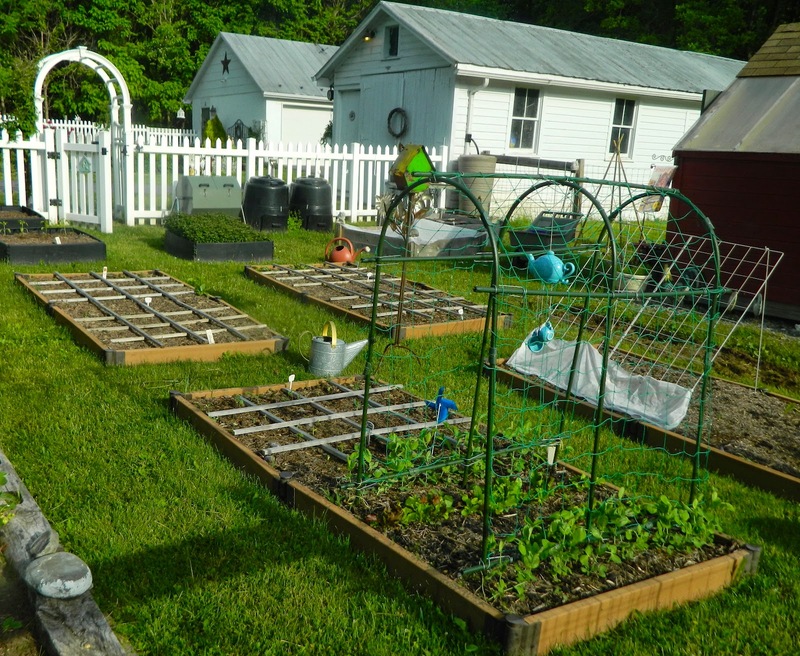 I write about how I choose seeds here. I wont repeat all this information now, as it is easy for you to find it using these links. End of May : I finish sowing and planting. 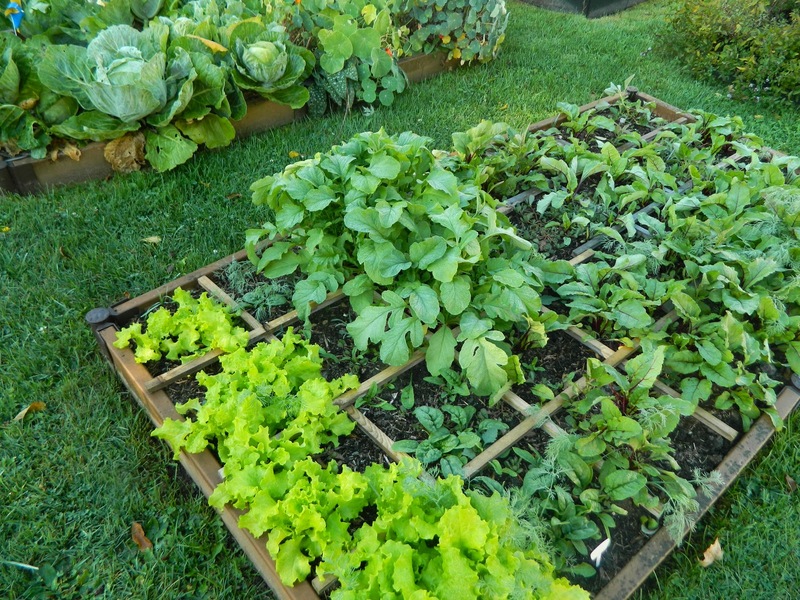 I use the square-foot gardening method. Middle of June : Snow peas, bush beans, and cukes sprout. 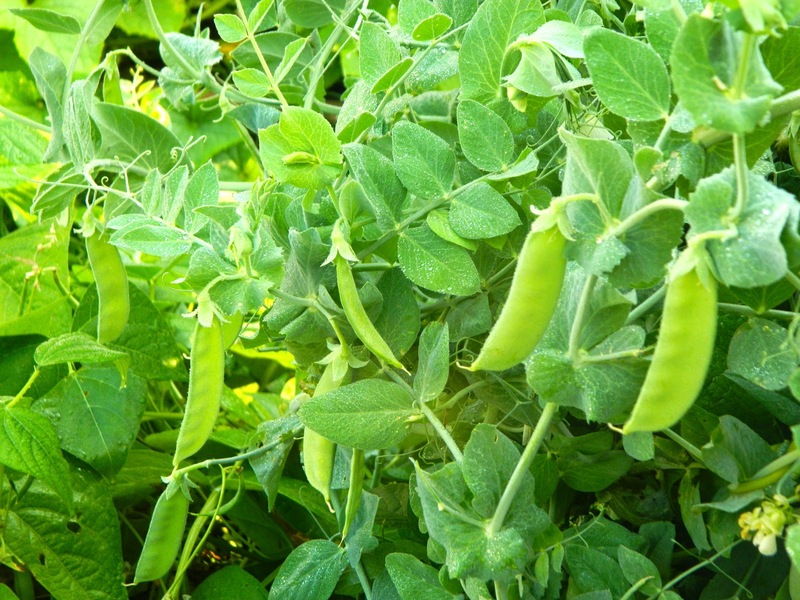 June - August : I harvest snow peas. 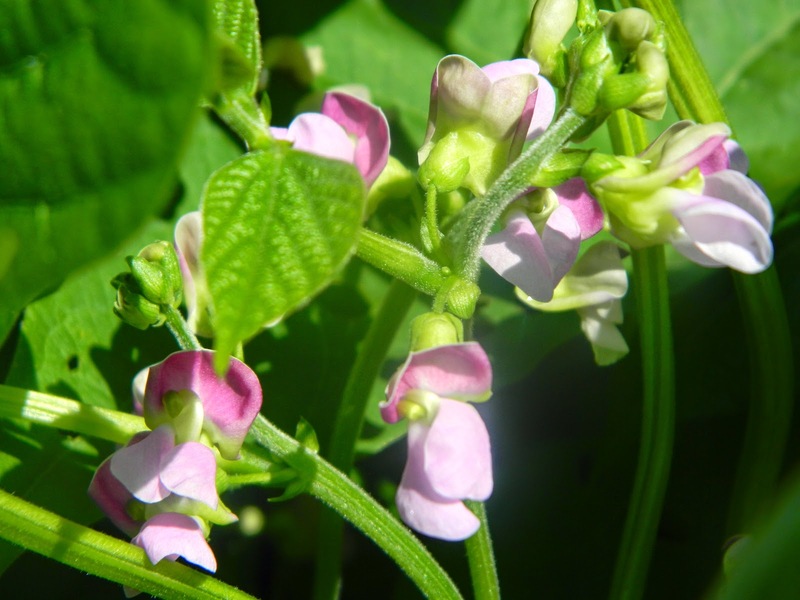 July : Beautiful blossoms on the bush beans. 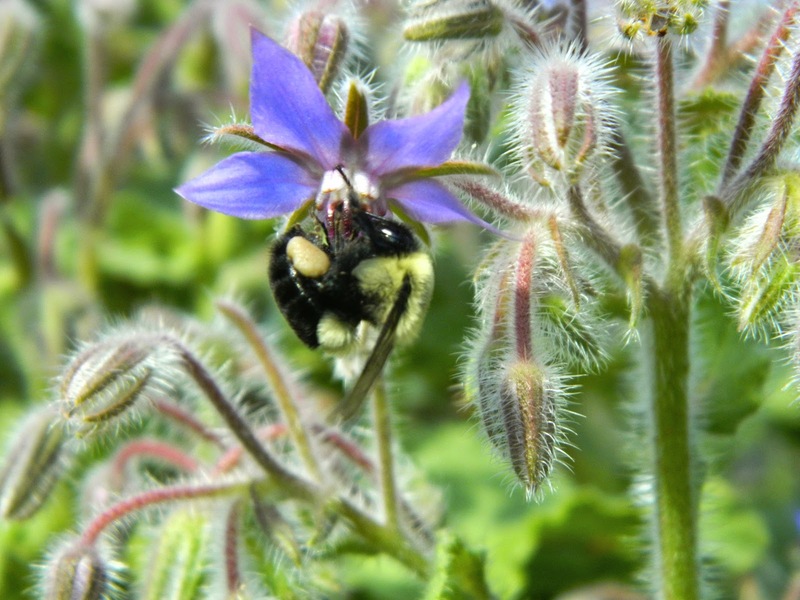 August : Acrobatic bee on borage. 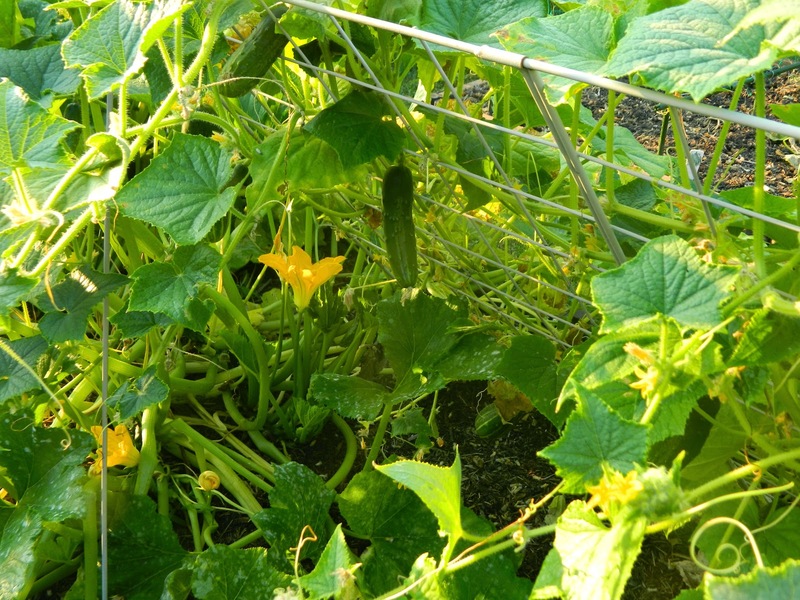 August and September : I harvest cucumbers and zucchini. 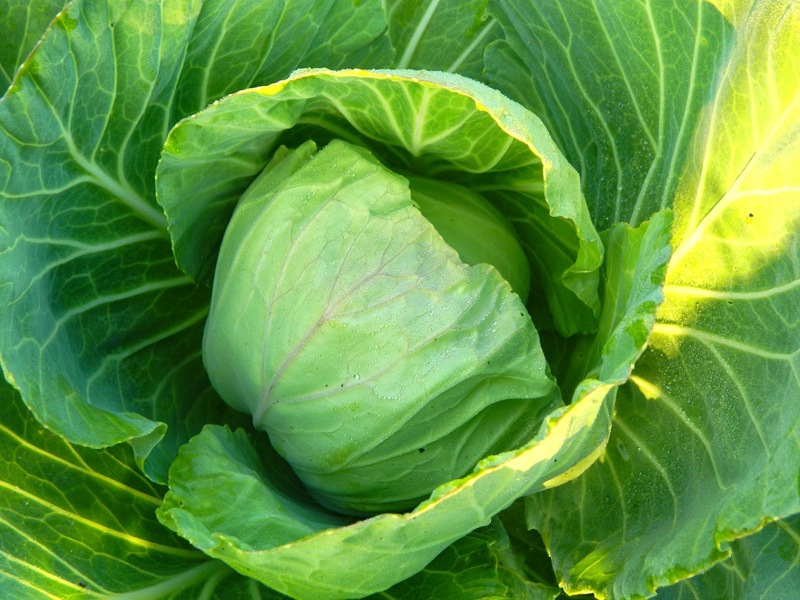 August through October : Pick cabbages. 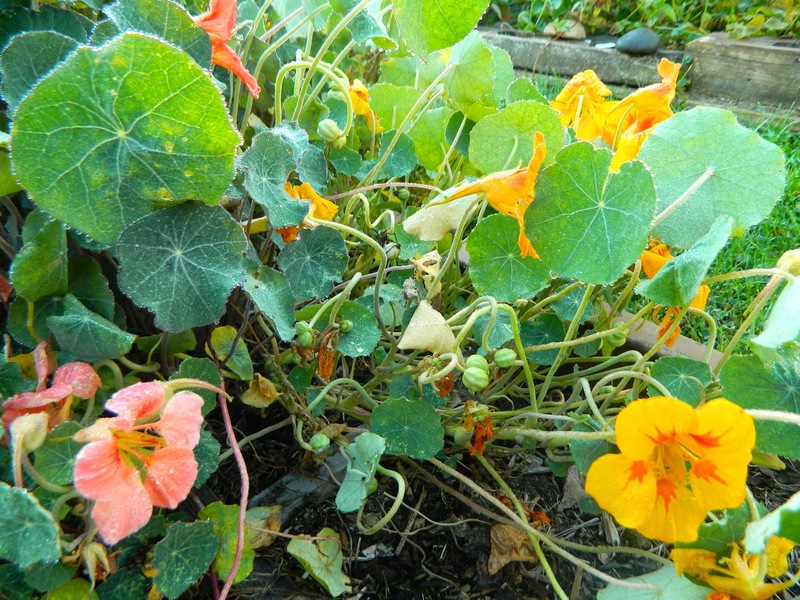 By the beginning of August the cantaloup plants have escaped. 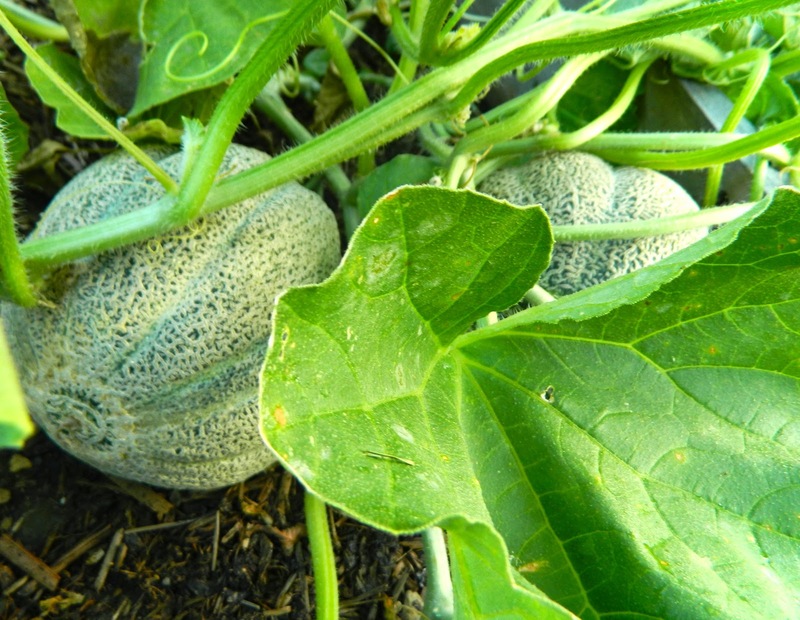 Cantaloups are late to mature. 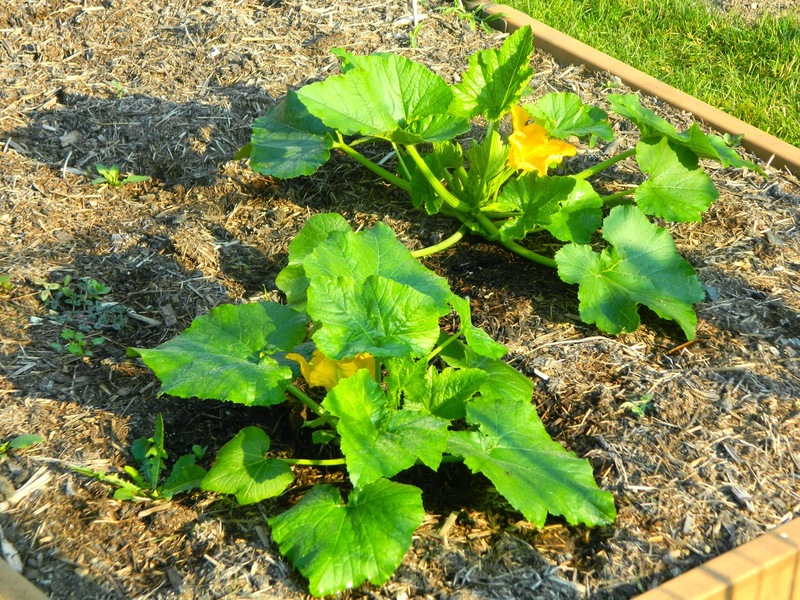 Begin harvesting them in early September. Peppers are even later. Pick most of them at the beginning of October. Still have plenty of onions. I picked all the carrots this week, but left the parsnips to enjoy a little frost. Frost definitely improves their flavor. Note the empty bamboo tepee -- the runner beans were a complete failure this year, mainly because of Japanese beetles and that pesky rabbit. The little pest ate all the sunflowers, beets, Swiss chard, and spinach as soon as the plants popped up out of the soil. 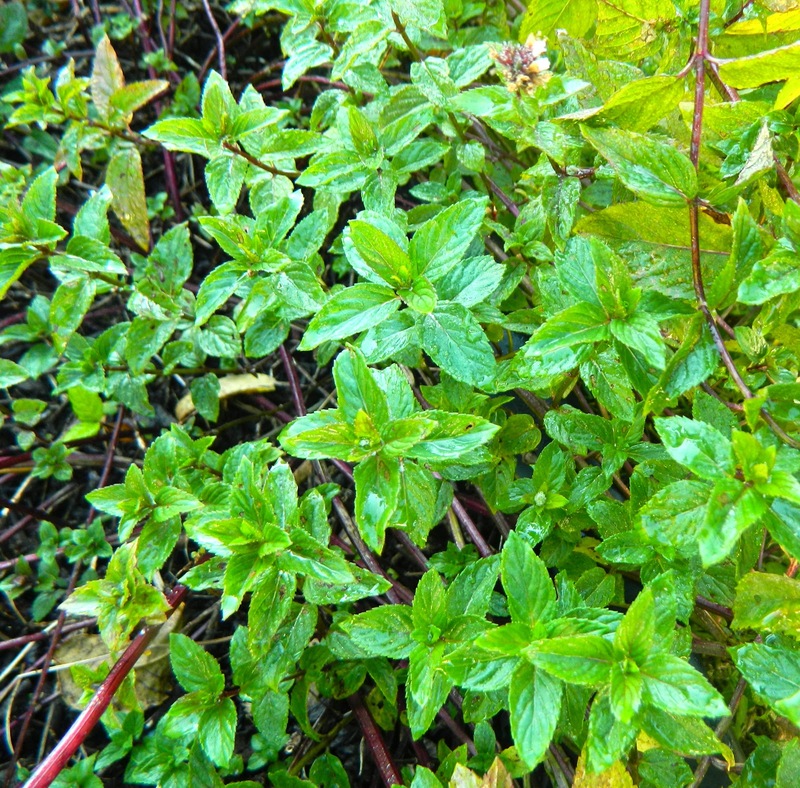 I was in England at that time and the plants were totally unprotected. 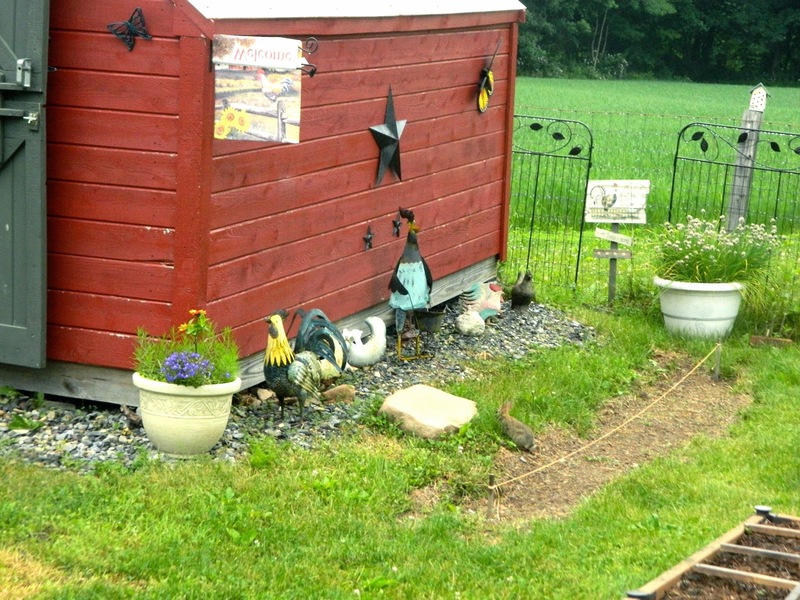 Can you see the bunny returning to his home under the shed after eating a row of sunflower seedlings? Cute, but oh, so distructive! 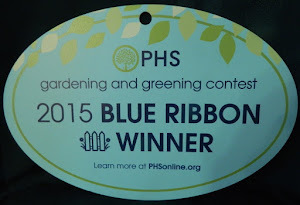 I was most upset at the loss of my beets, which have taken a first place ribbon at the Fair the last couple of years. Also, I missed making jars of pickled beets -- a family favorite. Beets are a cool-weather crop, and as the bunny had relocated to the Woodland Walk by the end of summer, I decided to try again. 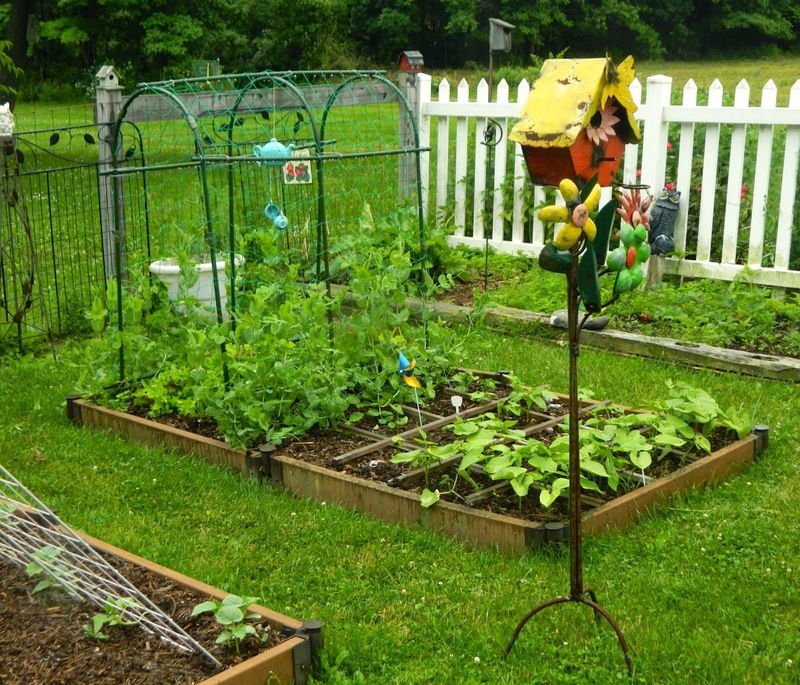 So instead of putting the whole garden to bed I planted lettuce, spinach, radishes, and beets. I scratched some well rotted compost into the soil in preparation. I timed the planting so that the young greens would become well established before the weather cools off too much. As you can see, I was successful. 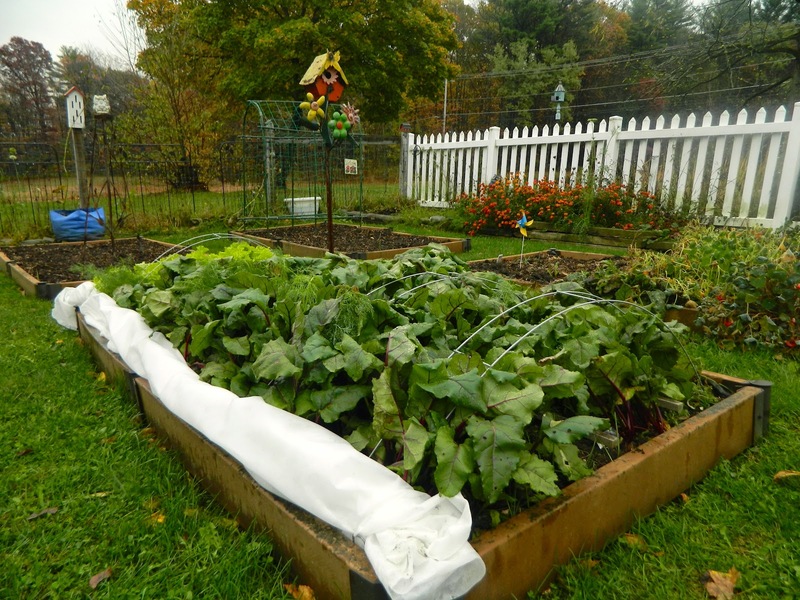 With frost forecast, on Sunday I covered the salad/beets bed with fleece and I harvested the rest of the crops. No more frost forecast for a few days, so I rolled the fleece back. 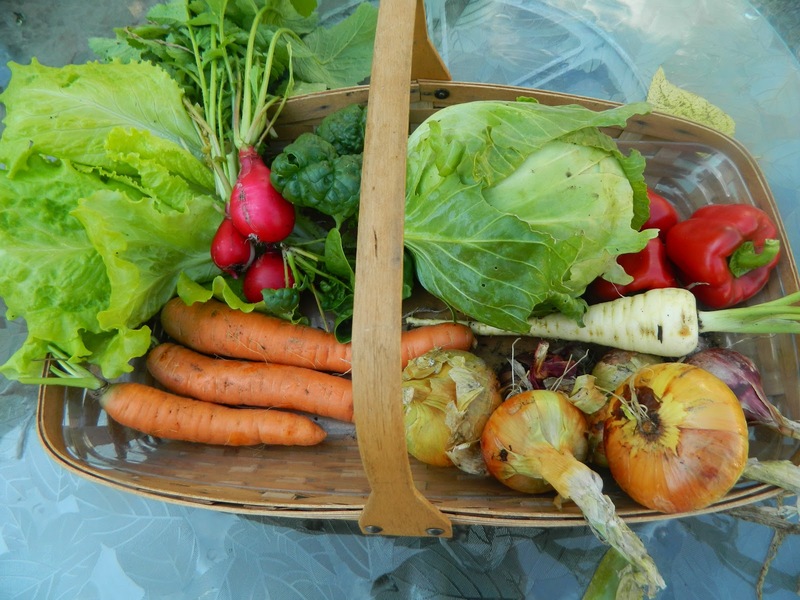 The last few days, I picked salad greens, radishes, peppers, carrots, cabbage, parsnips, and onions. The beets are not quite mature enough yet. My haul before the frost. 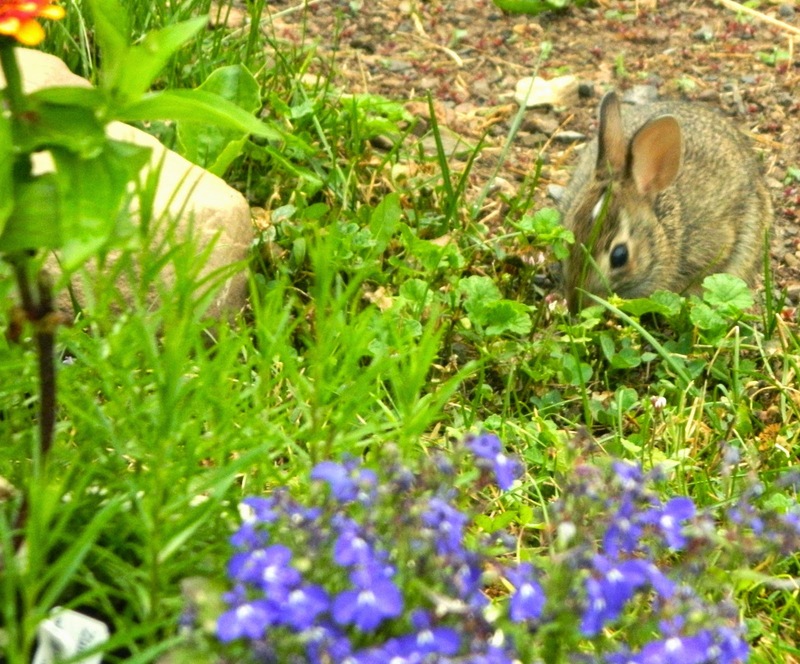 I guess I have the rabbit to thank for prompting me to plant a late harvest. 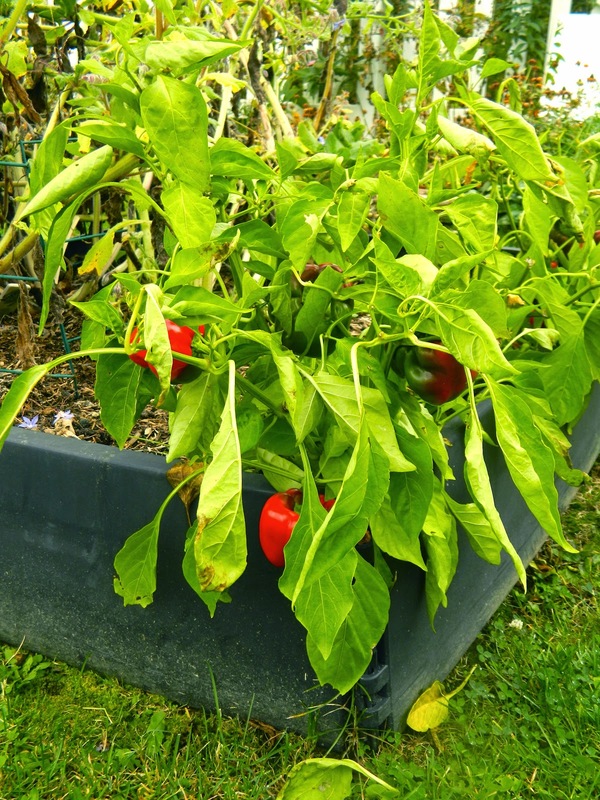 I will definitely plan to grow cool-weather crops again next year, although I will also protect my spring crops! 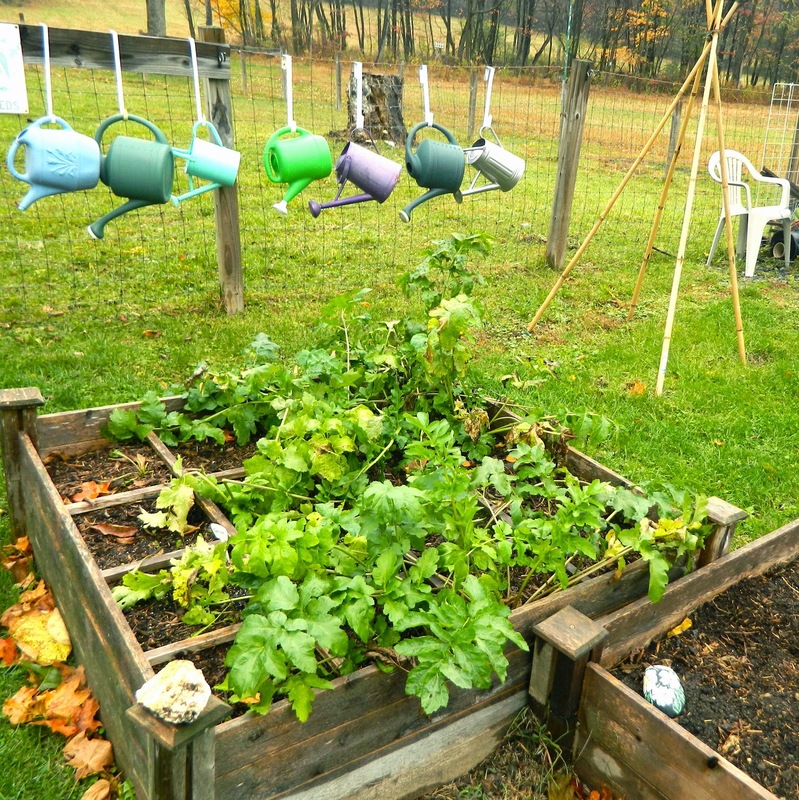 Do you extend your growing season? 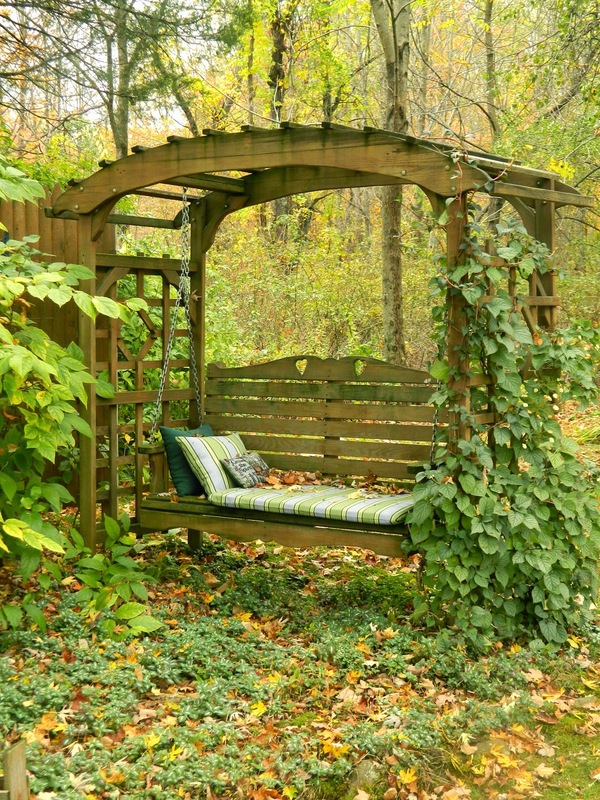 It is near the end of the gardening year in the northern hemisphere. My feelings are mixed at this time, because I'm sad that it is ending, and yet look forward to RESTING (after I've canned the beets, of course.) 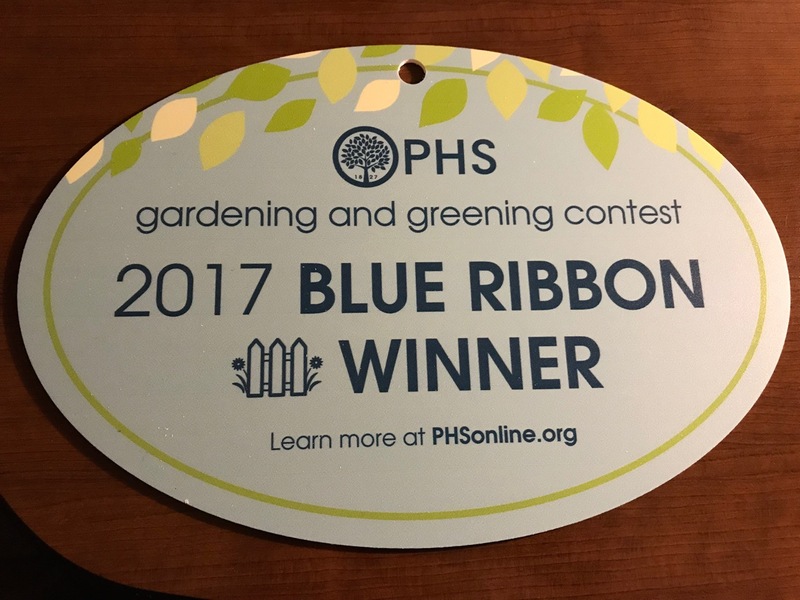 I don't think I would be able to garden year-round. 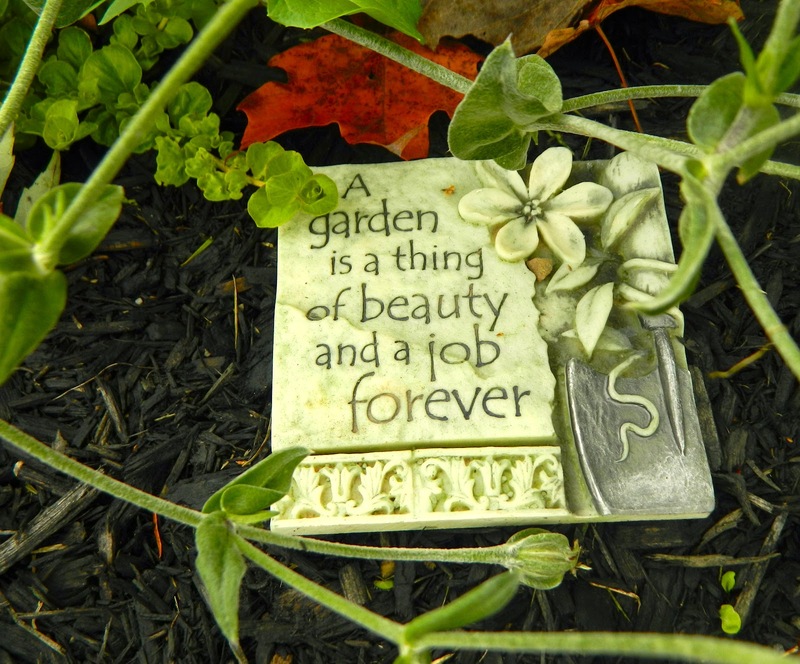 Whatever the season where you live, enjoy your garden! Today dawned cloudy and damp. Not ideal conditions for taking photographs. 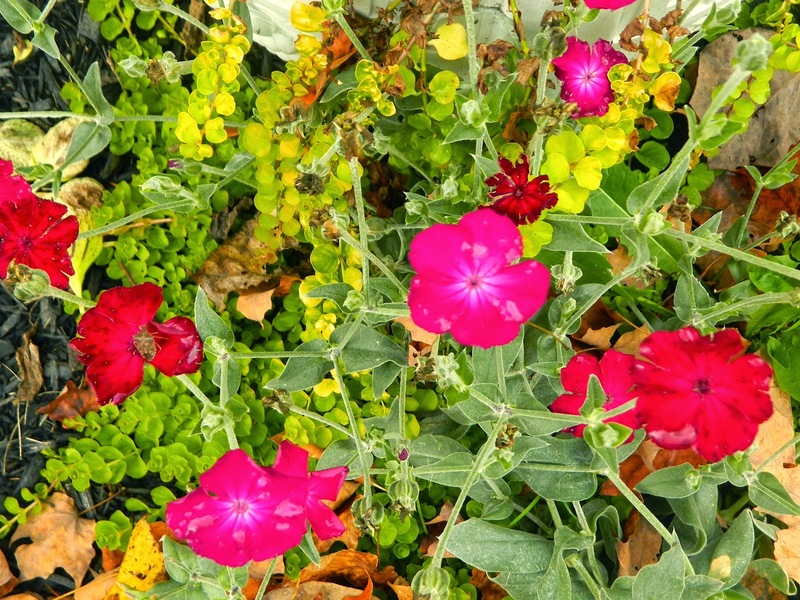 But it is Garden Bloggers' Bloom Day, so I venture outside to try my luck. 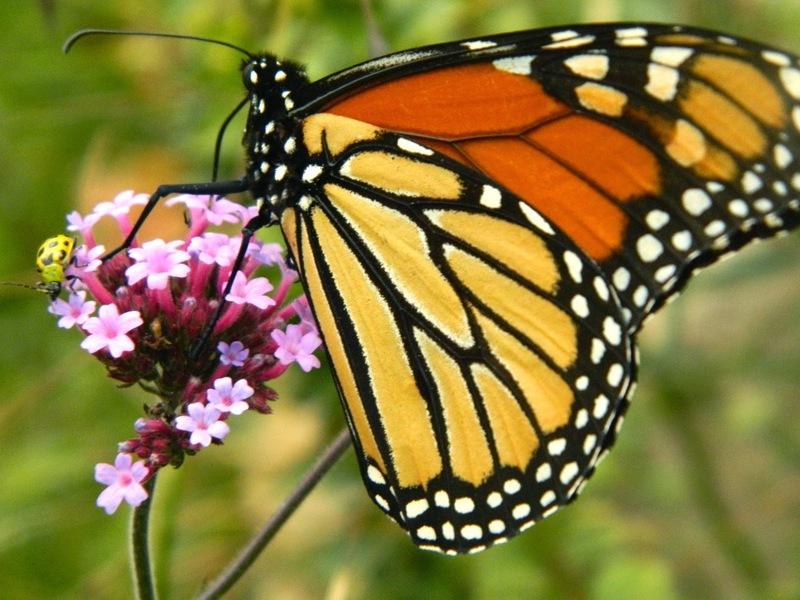 I can hardly believe my eyes when I see two monarch butterflies dancing among the verbena. 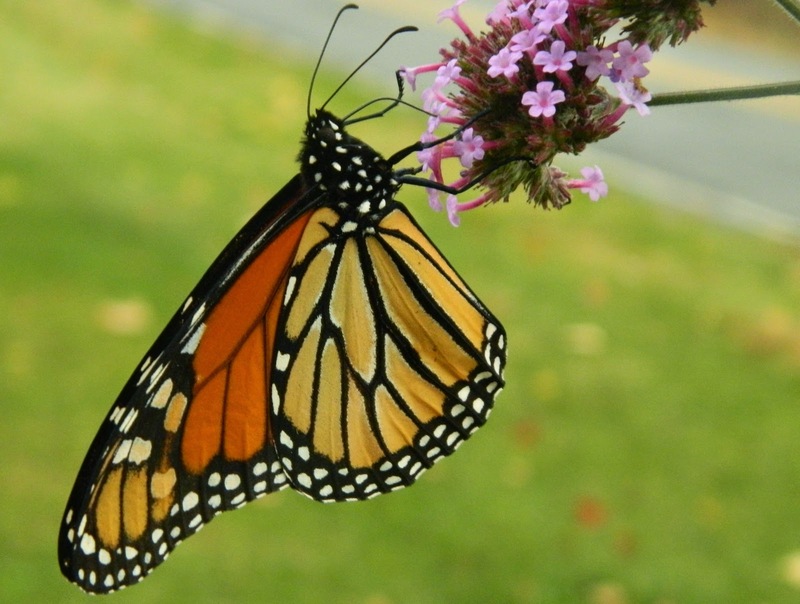 Few monarchs visited my garden this year, in spite of all the additional milkweed I planted, so I am delighted to see these beautiful creatures today. If you look closely at the first picture, you will see a yellow ladybug there, also. 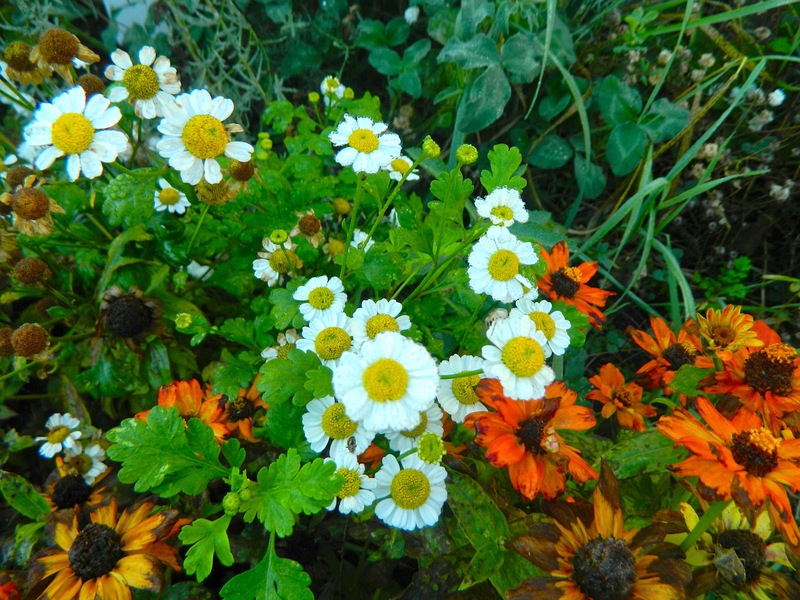 What began as a dreary day turned into a joyous one with this little taste of summer in my entry garden. 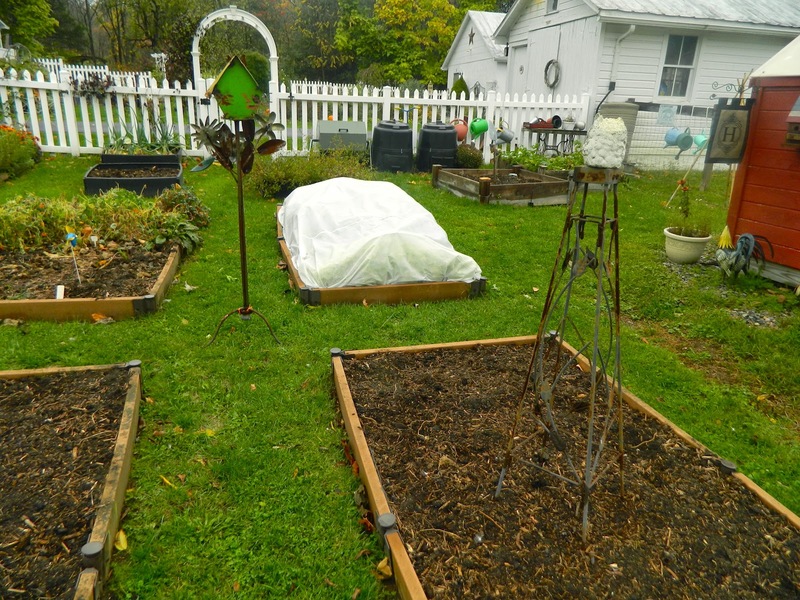 The rest of my garden is a picture of autumn with fallen leaves and fall colors. 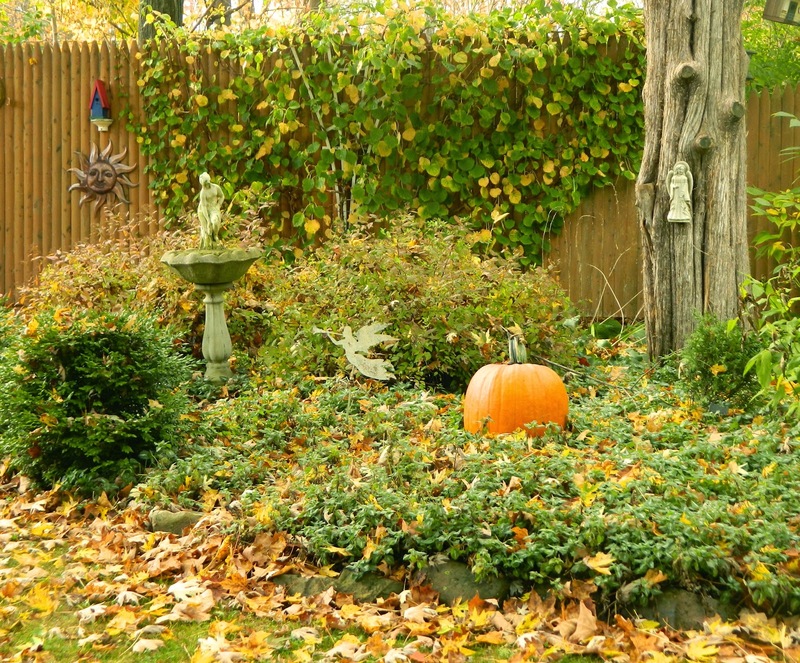 I love the colors, but feel the garden looks very untidy, especially as I haven't started the fall clean-up in earnest. Looking at Octopus's Garden I see I have an enormous amount of work to do. You can't tell in the picture below, but I must weed, divide, and cut down dead perennials. Time to put this untidy garden to bed. Let's take a walk and see what is blooming. 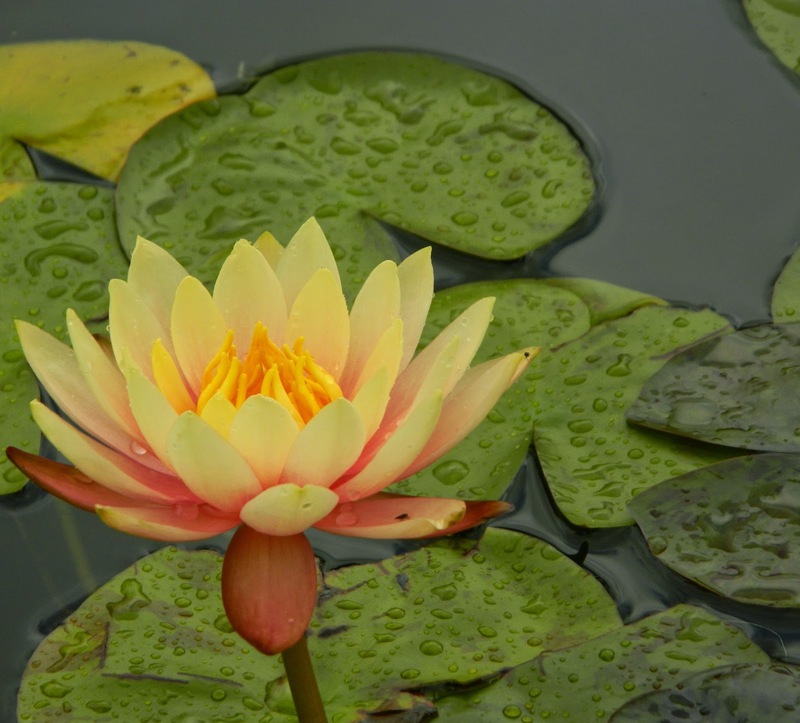 One last waterlily on the pond. 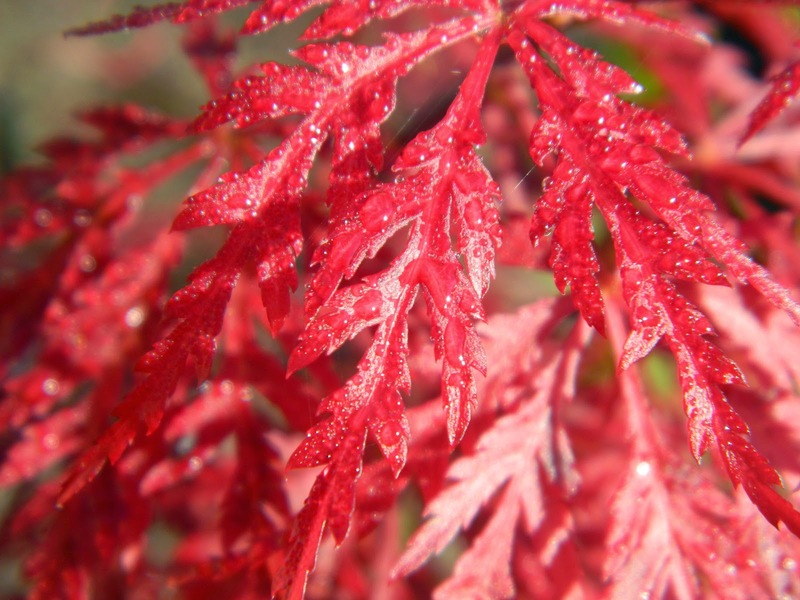 The weeping Japanese maple over the waterfall is turning a spectacular red. 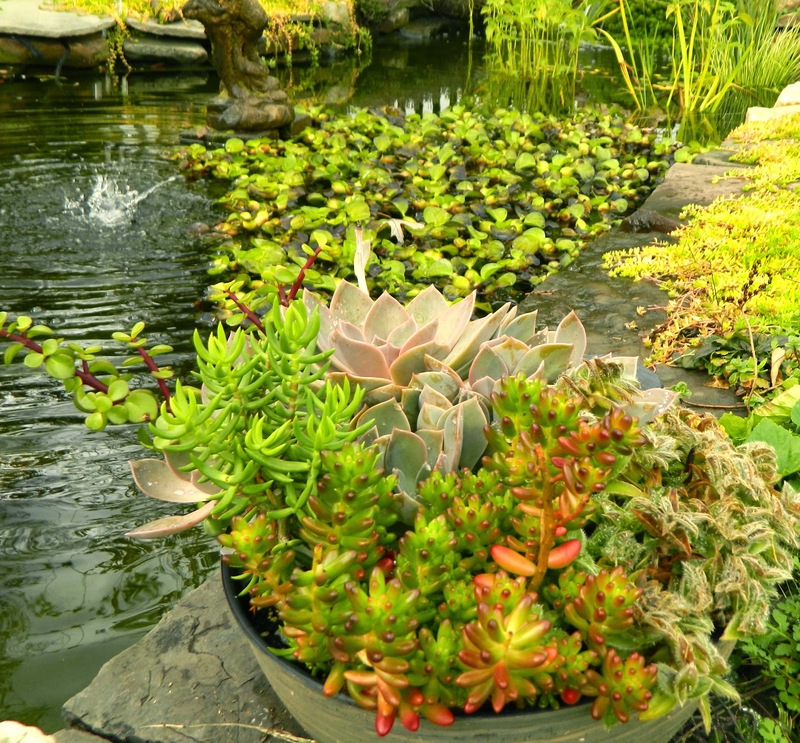 Not blooms, but lovely textures in a bowl of succulents. At last I have some beautiful rose blooms. 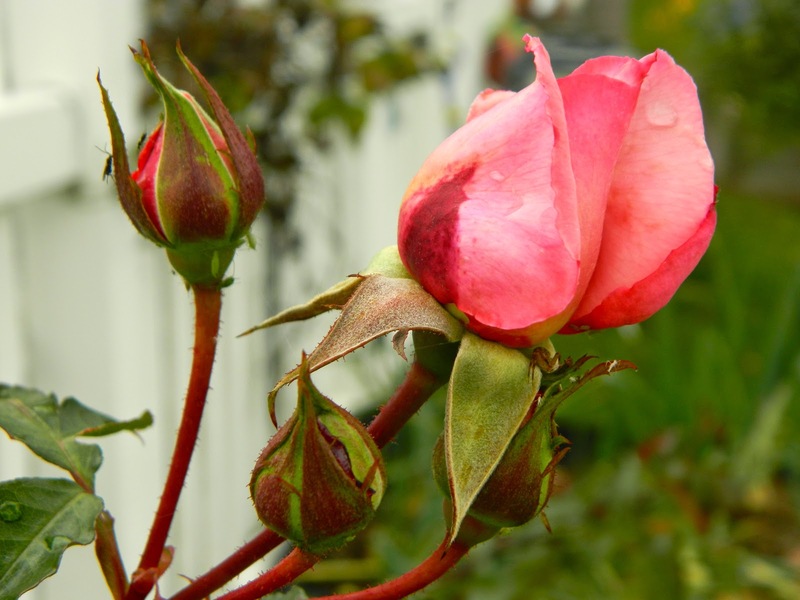 Winter damage and Japanese beetles created the worst year for roses I have experienced. 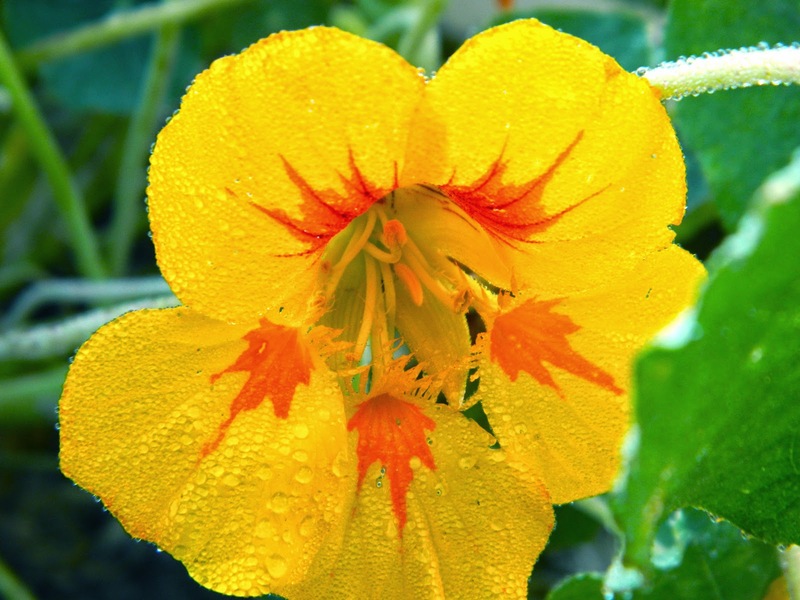 Now two of my favorites are blooming and the flowers remain undamaged since there are no more beetles. 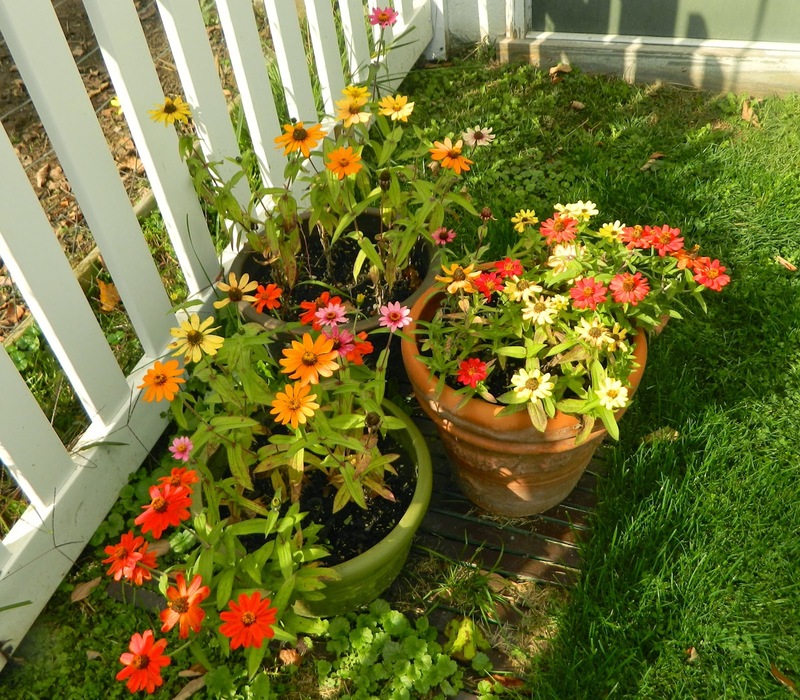 Tubs of zinnias catch a little sunlight. 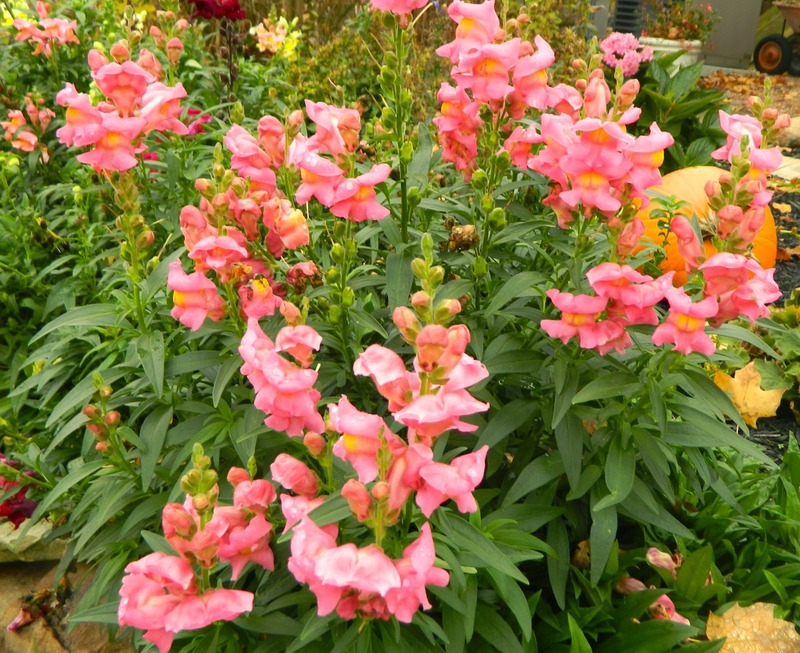 This has been a wonderful year for snapdragons. The new horseshoe-shaped garden-with-no-name is still ablaze with them. 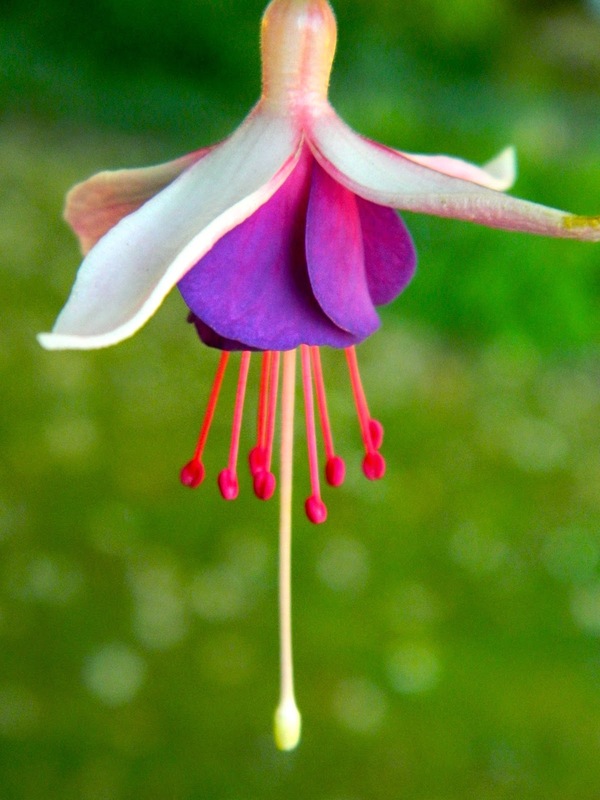 Fuschia in hanging baskets on the porch. 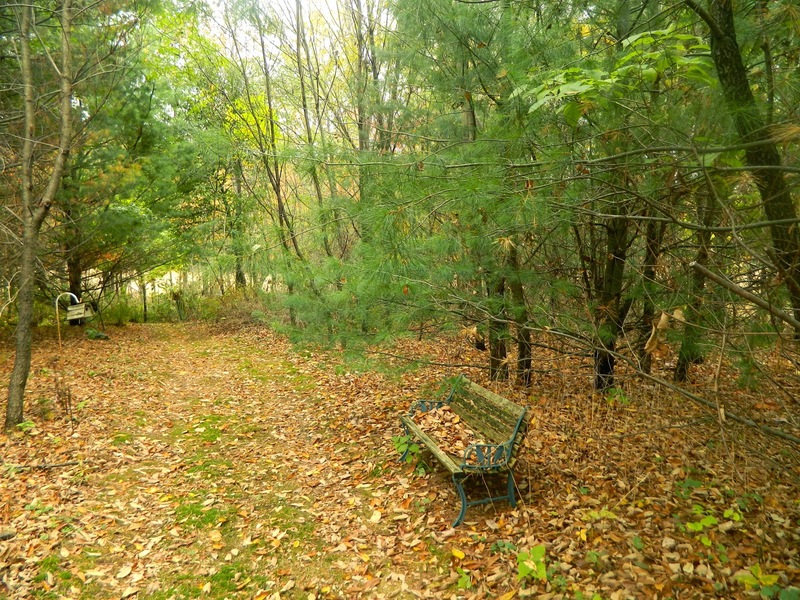 No blooms in the shade garden, just lots of fallen leaves. The leaves of the climbing hydrangea on the fence are turning golden. 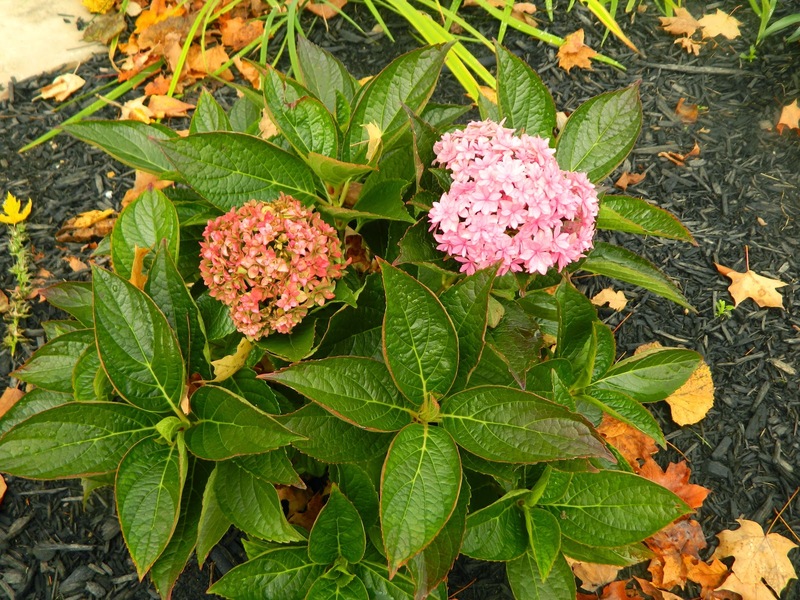 It is not easy to see on the picture below, but the false hydrangea climbing over the swing bloomed this year and a few petals are evident still. 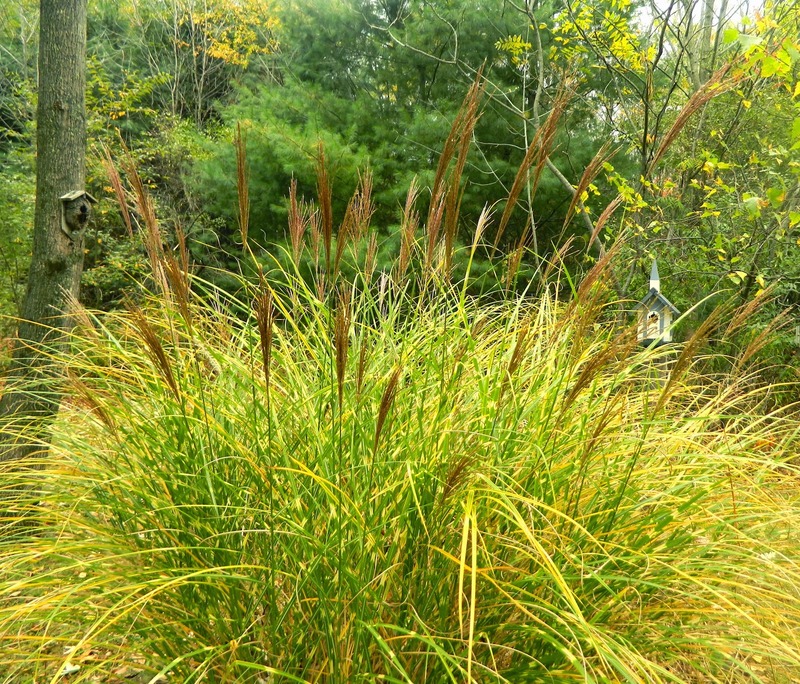 At the entrance to the Woodland Walk, the zebra grass is resplendent with feathery panicles. 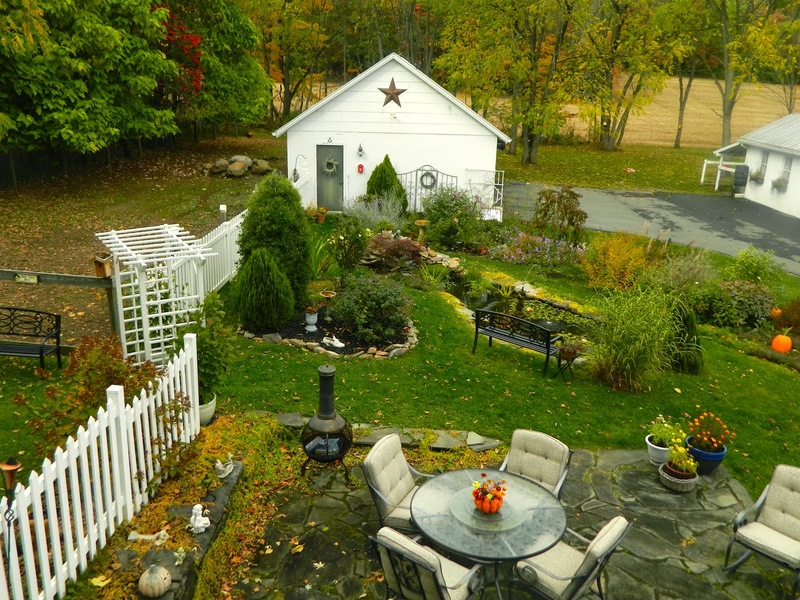 More zebra grass at the front of this picture and beautiful fall colors behind the potting shed. 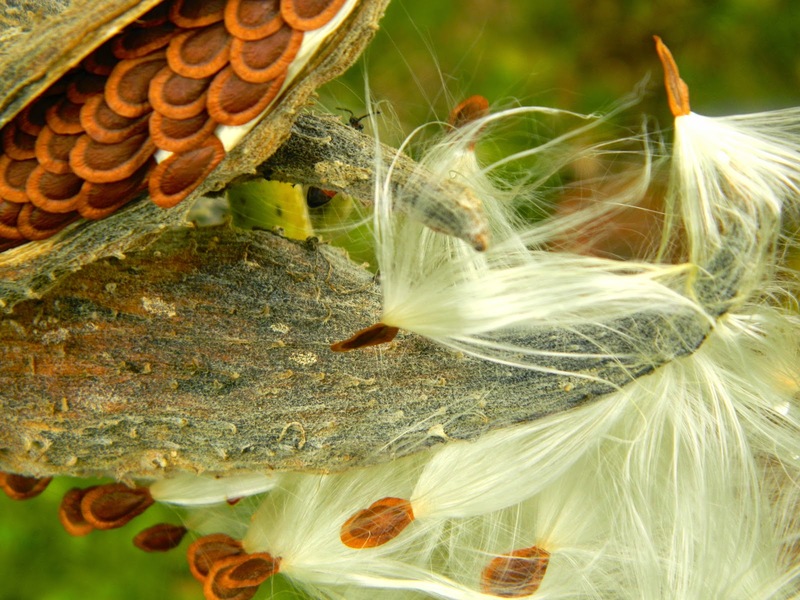 Milkweed seeds give me hope there will be monarchs next year. 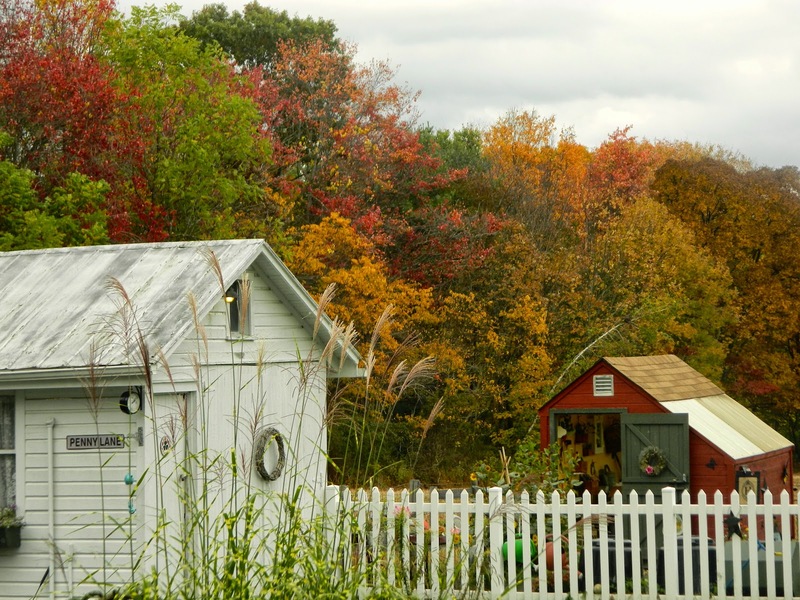 The Pocono Mountains of Pennsylvania are wonderful for fall colors. 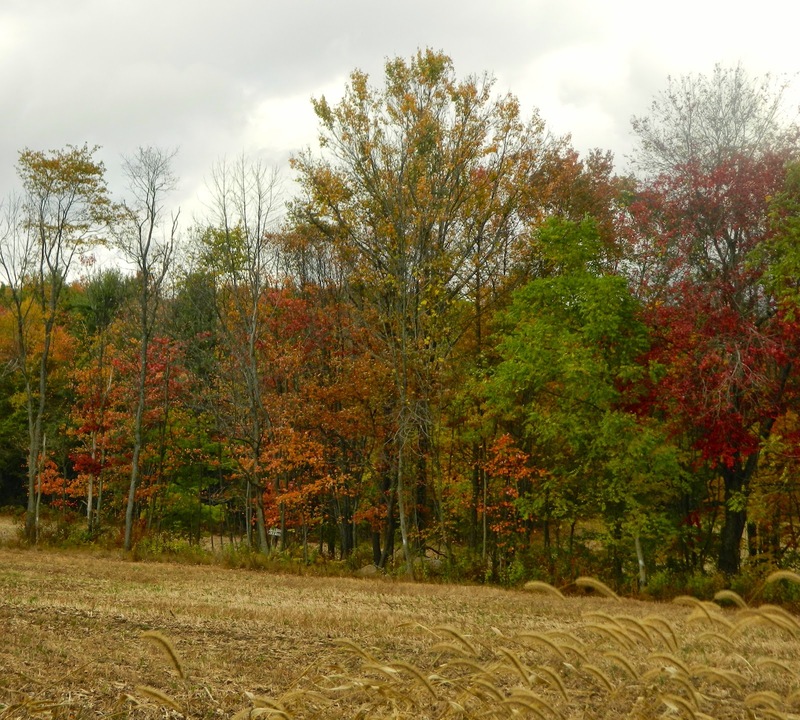 The trees around our fields are nearing peak splendor. 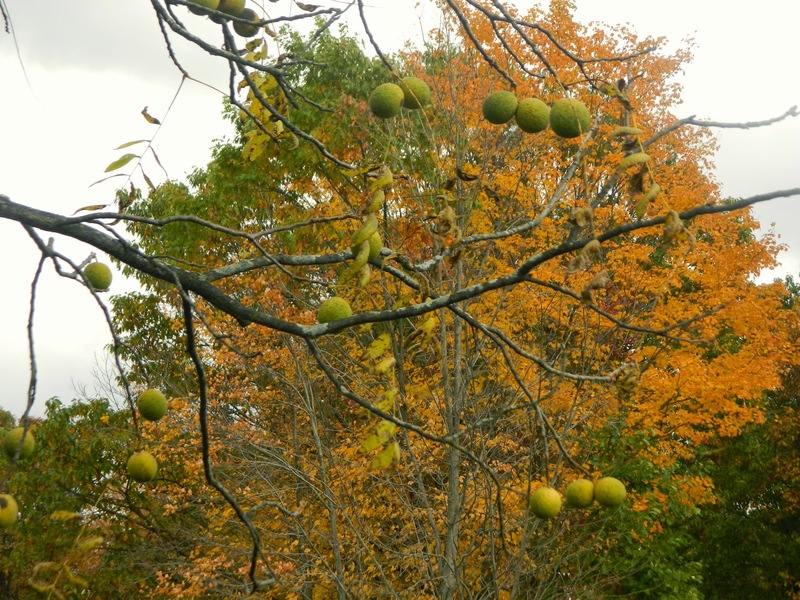 An abundance of nuts on one of our many walnut trees. Does this mean a harsh winter? Finally, on our Bloom Day walk, we return to the entry garden which I planted as a butterfly garden this year. 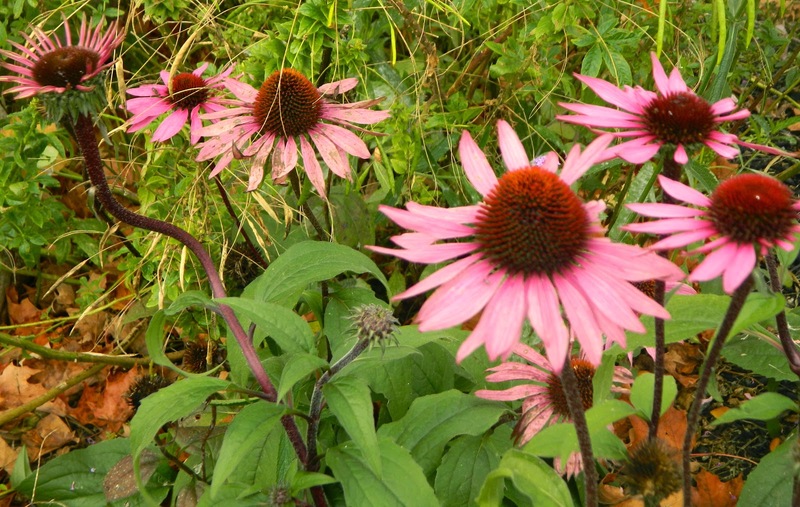 The new echinacea are still blooming with no sign of the aster yellows disease which necessitated pulling out all purple coneflowers in the cottage garden. 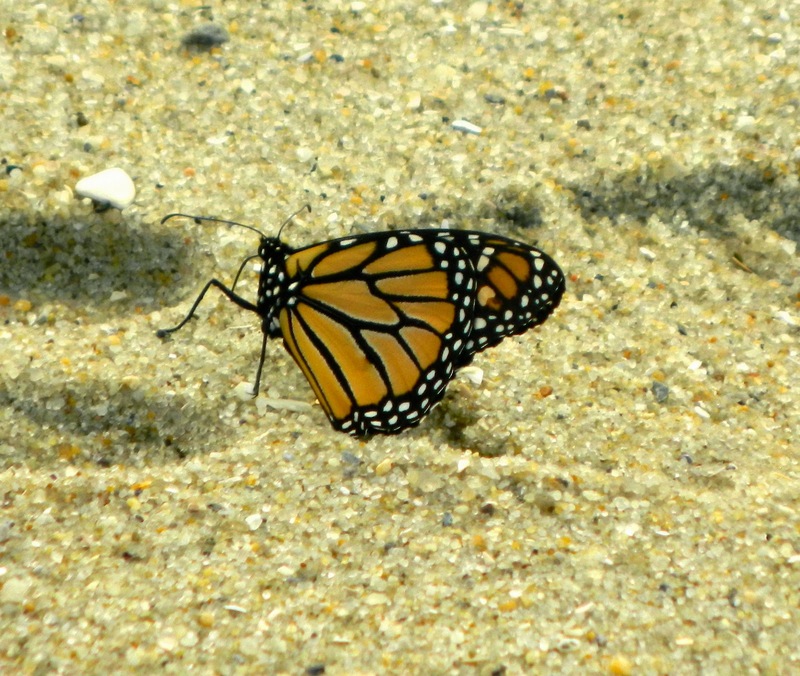 The monarchs have left. It has started to rain. I go indoors just in time. As I write this, it is pouring, but a blessing really because we are 7 inches down on rain for the year. My thanks to Carol for hosting Garden Bloggers' Bloom Day on the 15th of each month at her lovely blog, May Dreams Gardens. If it wasn't for you, Carol, I probably would not have ventured out this morning and I would have missed seeing my royal visitors. 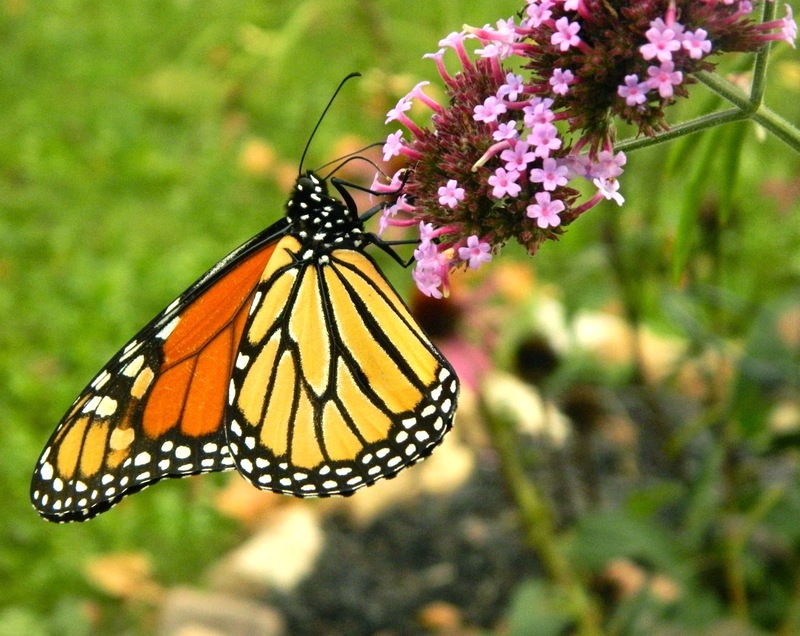 Carol has monarchs in her garden today, too. Do check it out! 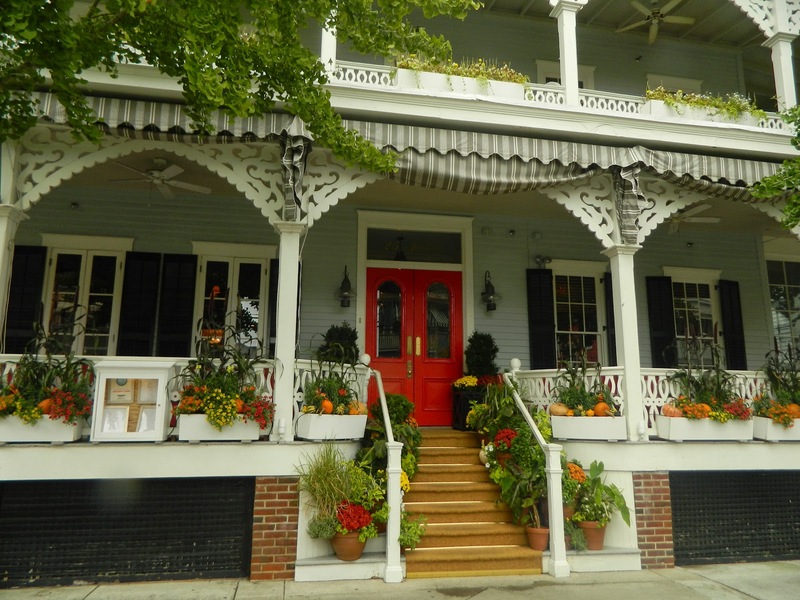 The Virginia Hotel beautifully decked-out for fall. 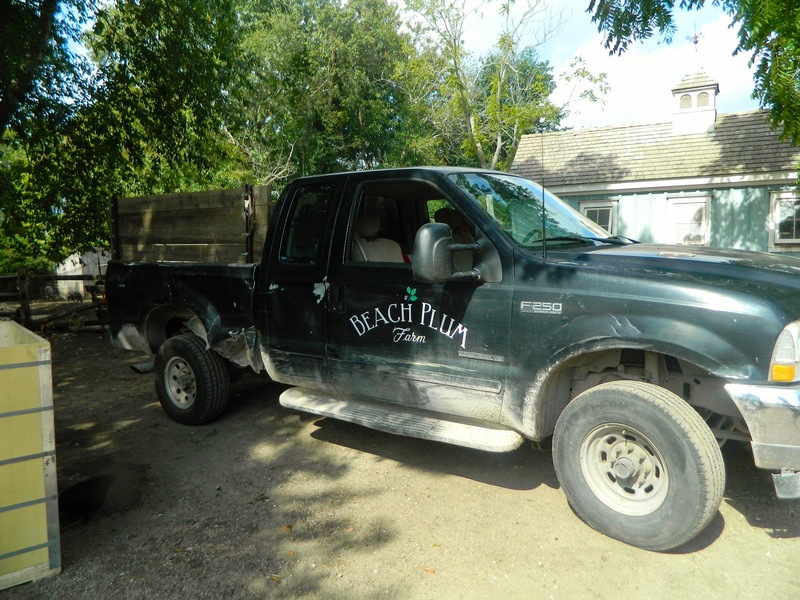 I never heard of a beach plum, did you? So when H.H. 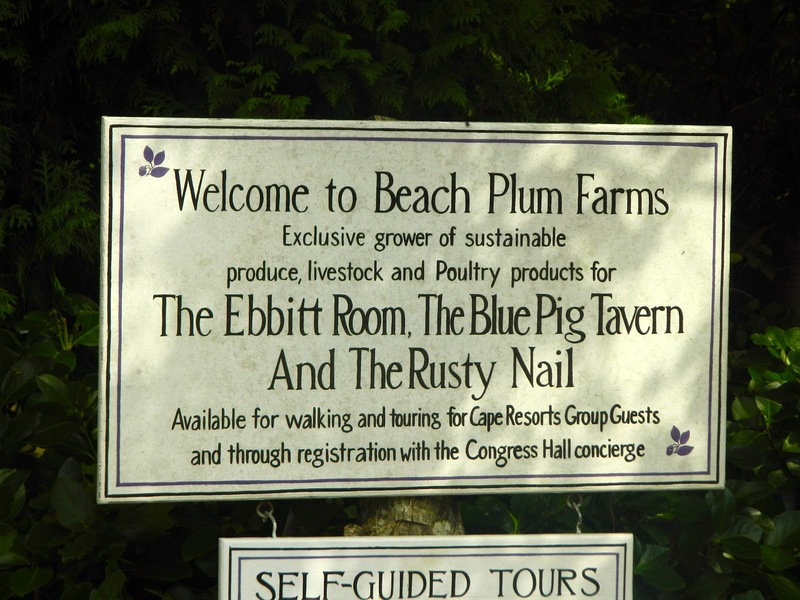 and I visited Beach Plum Farm a few days ago, its name intrigued us. I learned from The Beach Plum: A History and Grower's Guide that Prunus maritima is native to the sandy North Atlantic coast, from Newfoundland to North Carolina. 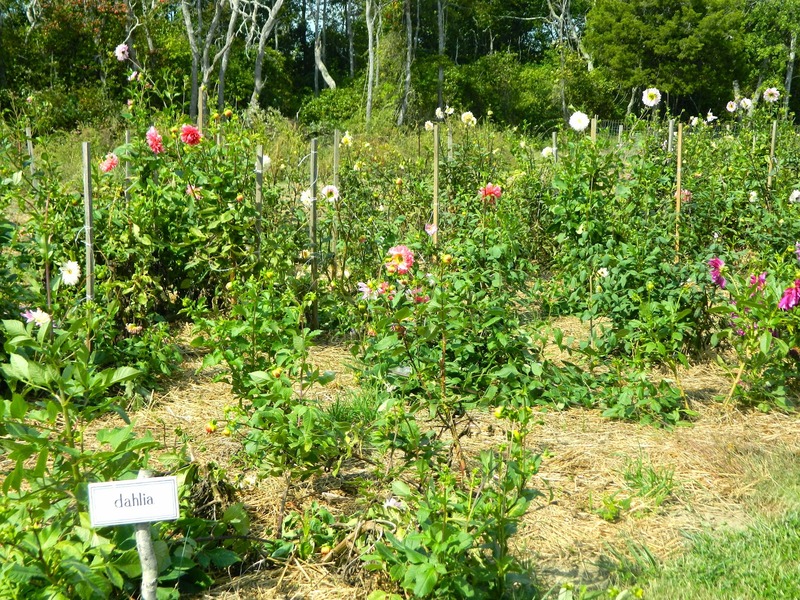 One of the first plants seen by the Colonists in the 1600's, the beach plum is an excellent conservation and erosion-control plant that can grow in poor soil. I am told the fruit tastes delicious in jelly/jam. I didn't get a picture of the plant when we toured the farm, because I didn't know what to look for at that time. I since learned they have about ten bushes. 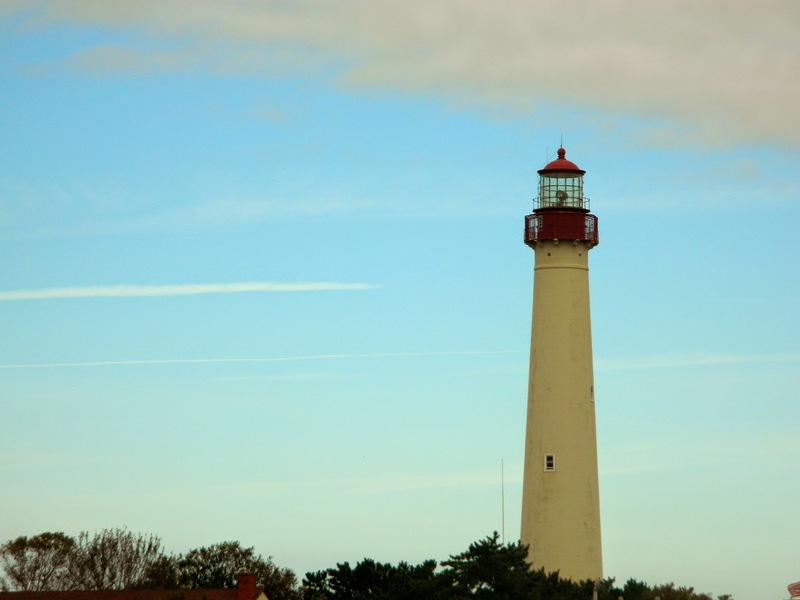 We stayed at Cape May's Virginia Hotel, home of the Ebbitt Room restaurant, to celebrate my birthday. We love the Virginia not least because of the delicious food. 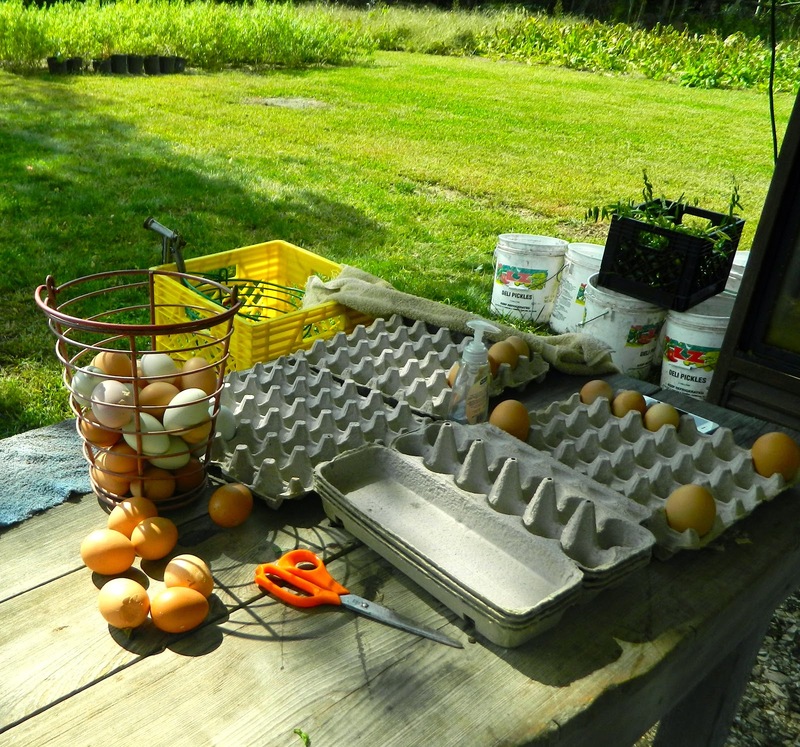 I started each day, on the front porch, with fresh boiled eggs, toast and incredible home-made jelly. At dinner we enjoyed fresh salads and vegetables from the farm. I relished my favorite drink, their Apple of Eden made with fruit and herbs fresh from Beach Plum Farm. One evening we ate at the Blue Pig Tavern which also provides food grown at the farm. Notice how many times I used the word 'fresh' in this paragraph -- I make no apologies. 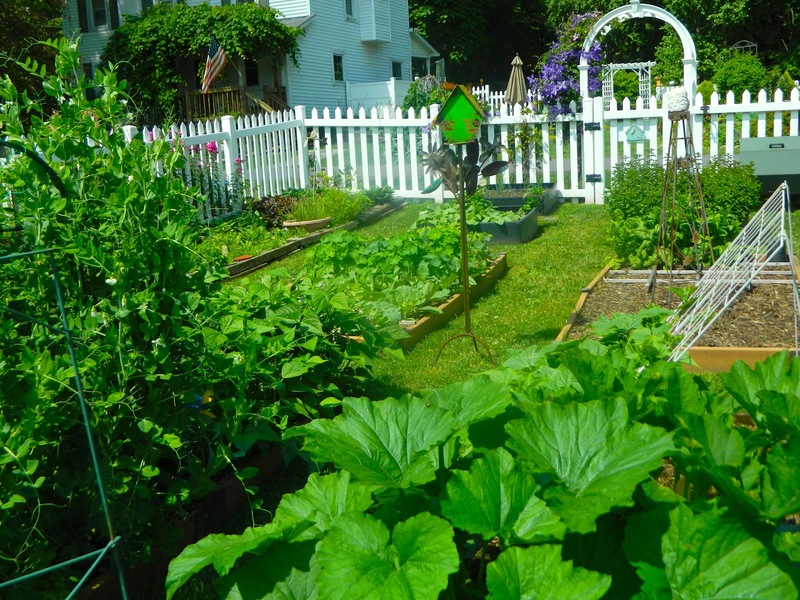 I love the idea of 'slow food' where restaurateurs serve food grown close to the table. 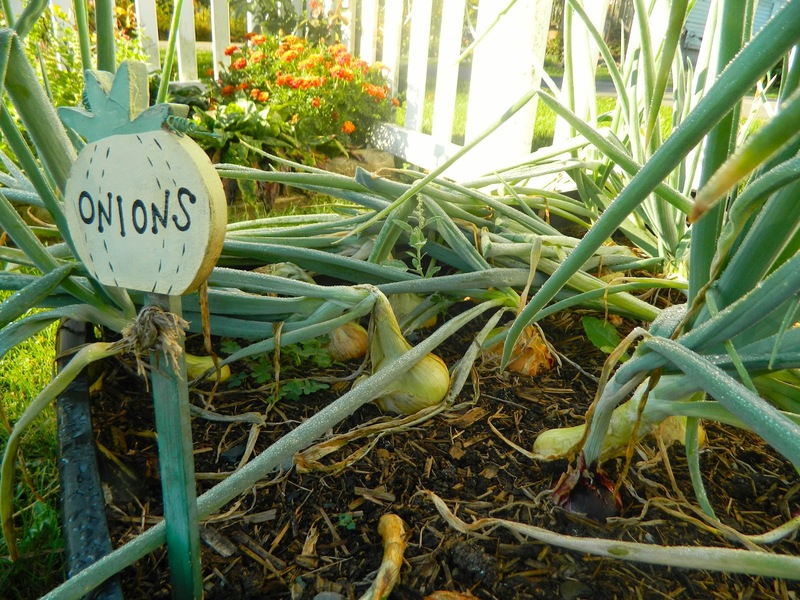 How gratifying that now a national movement focuses on sustainable and 'slow food' practices. 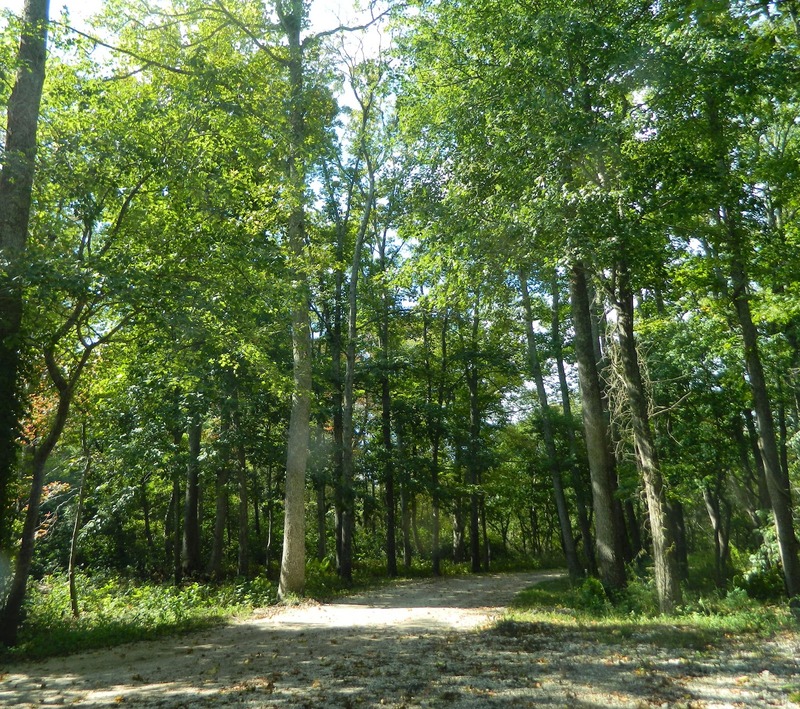 Beach Plum Farm's 62 acres in West Cape May, New Jersey, originally used by the Lenni-Lenape Indians, has a history that includes dairy farming and farming for lima and soy beans. 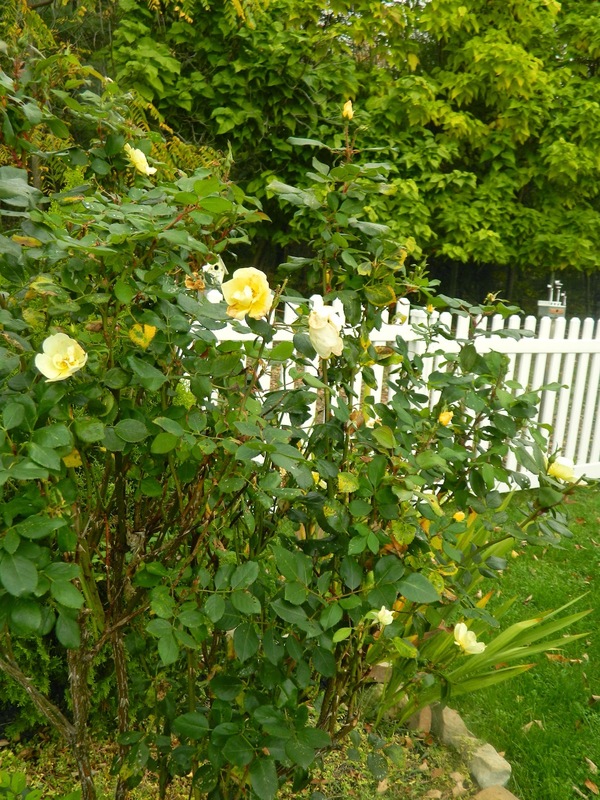 Cape Resorts purchased the farm in 2007 to provide fresh summer vegetables and flowers to their restaurants. 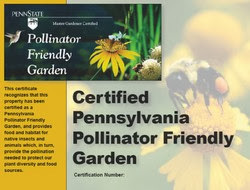 Since 2010 they added livestock: pigs, chickens, sheep, and most recently honey bees. 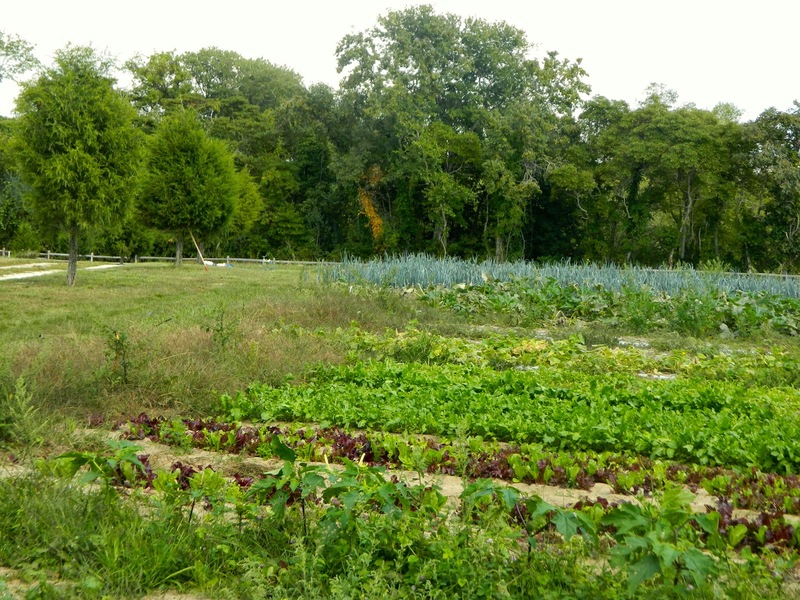 The farm produces more than 100 varieties of fruits, vegetables, herbs, and flowers for the company's kitchens. 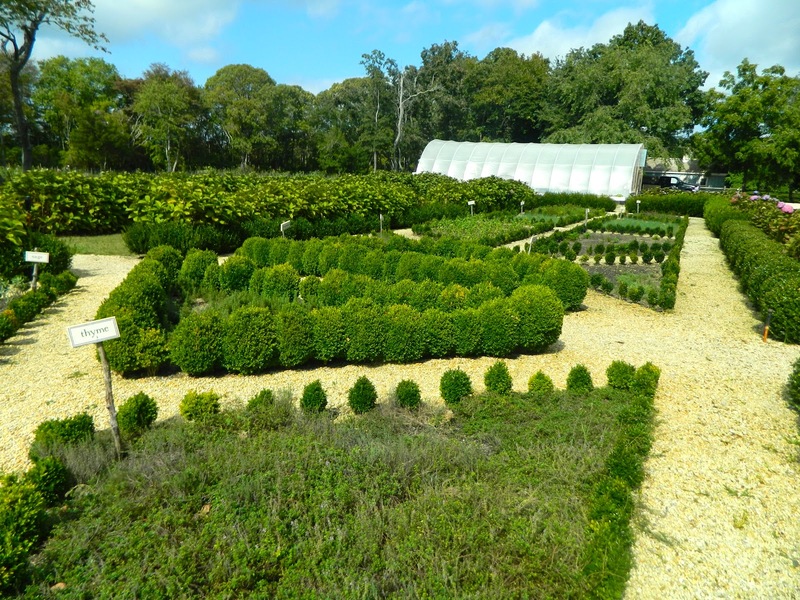 I love the geometrical design of the herb garden beds, each one edged with English boxwood. A hedge of hydrangeas borders the herb garden. 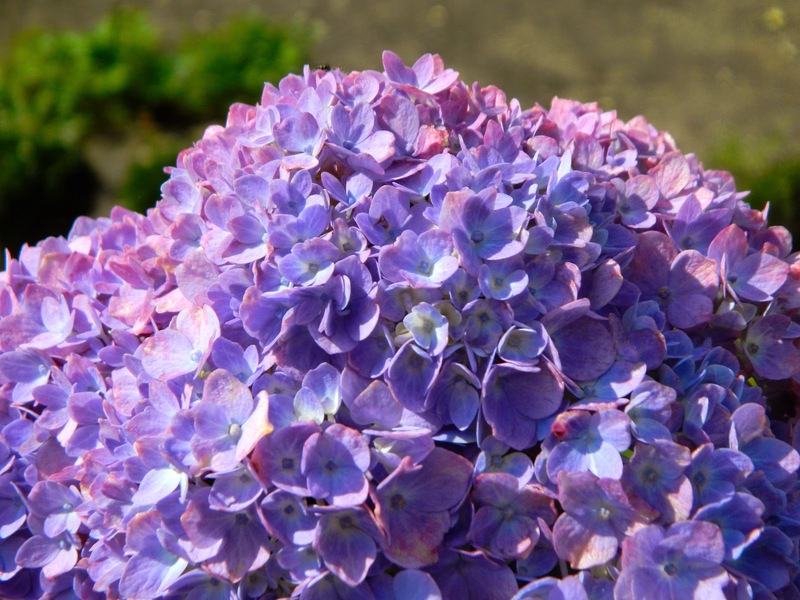 A few blossoms remained, hinting at its stunning beauty when in full bloom. 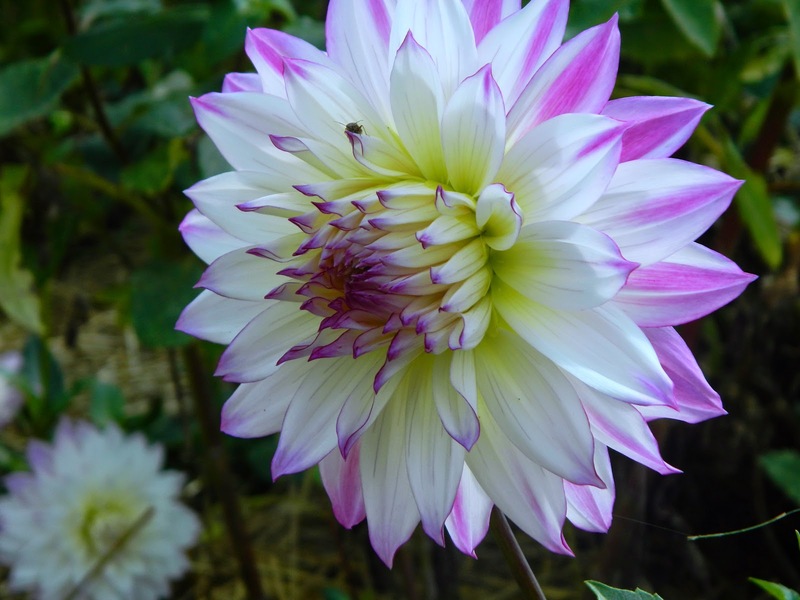 Dahlias were still strutting their stuff in the flower garden. 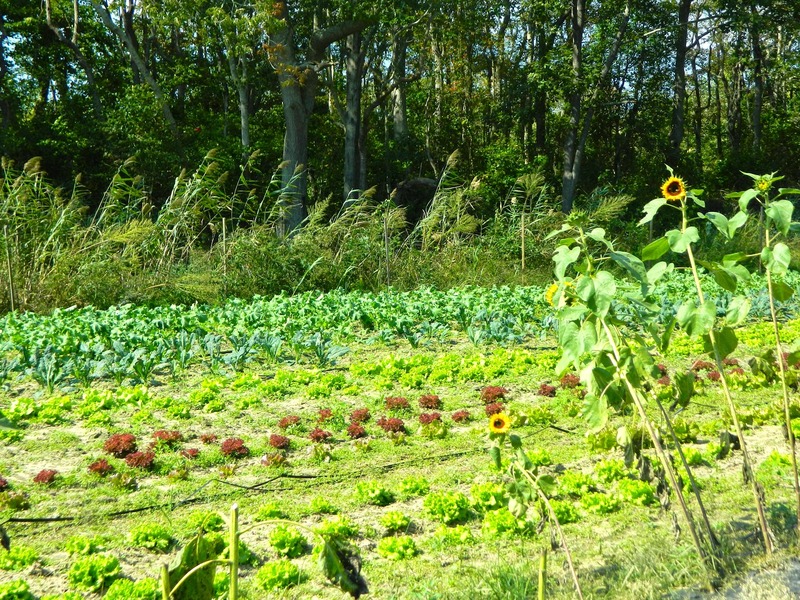 Sunflowers bloom next to salad vegetables. 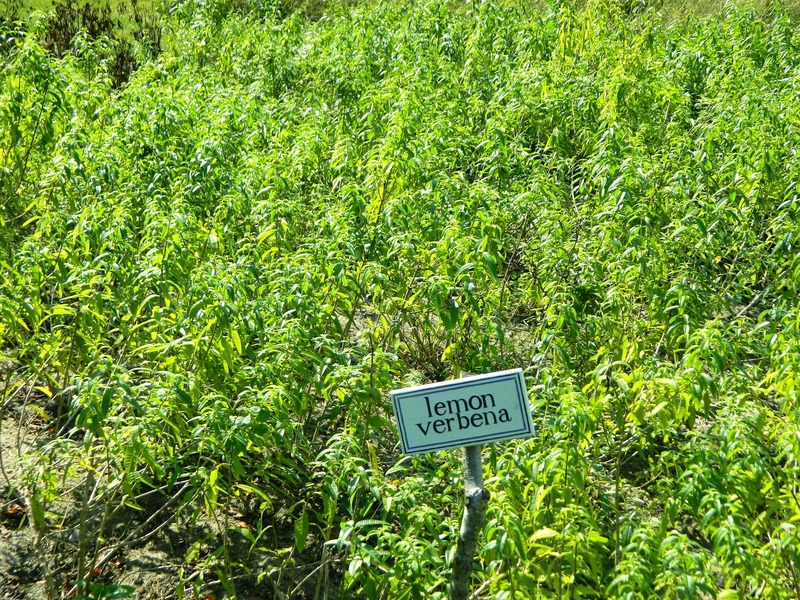 They make their own brand of teas at the farm, using lemon verbena, mint, sage, rosemary, and thyme. 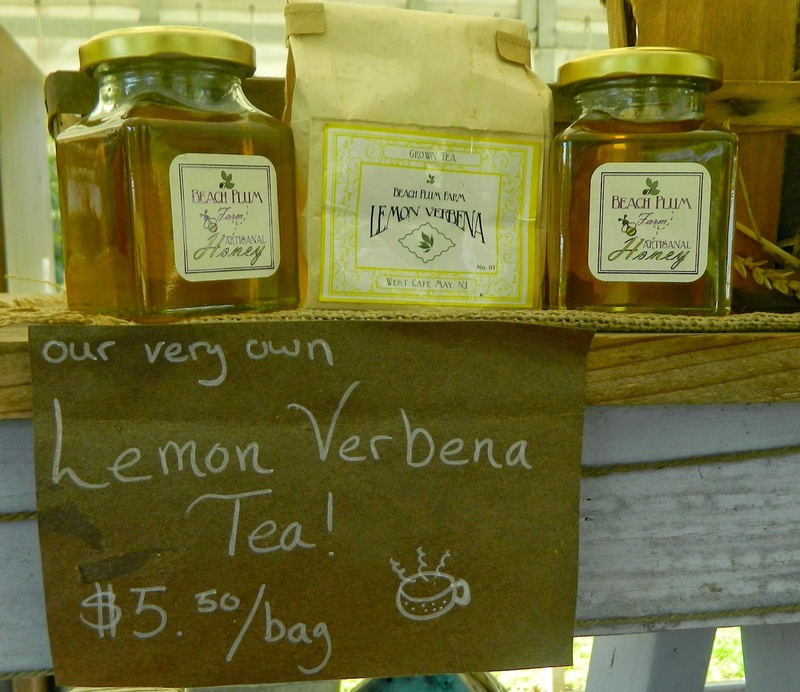 We found lemon verbena tea at the farm stand, with honey, its perfect accompaniment. 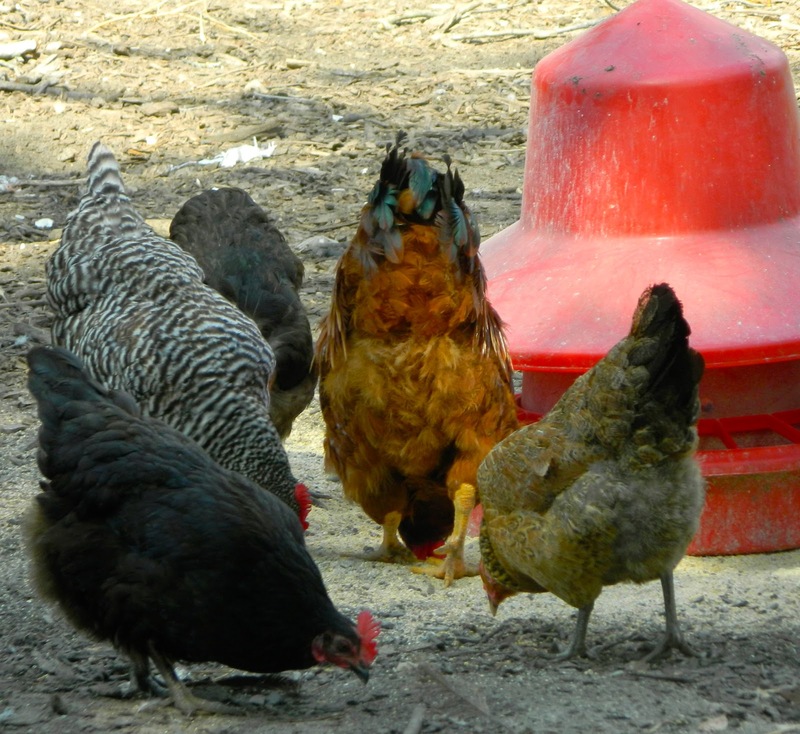 Beach Plum Farm hens produce 20 to 30 dozen fresh eggs daily. 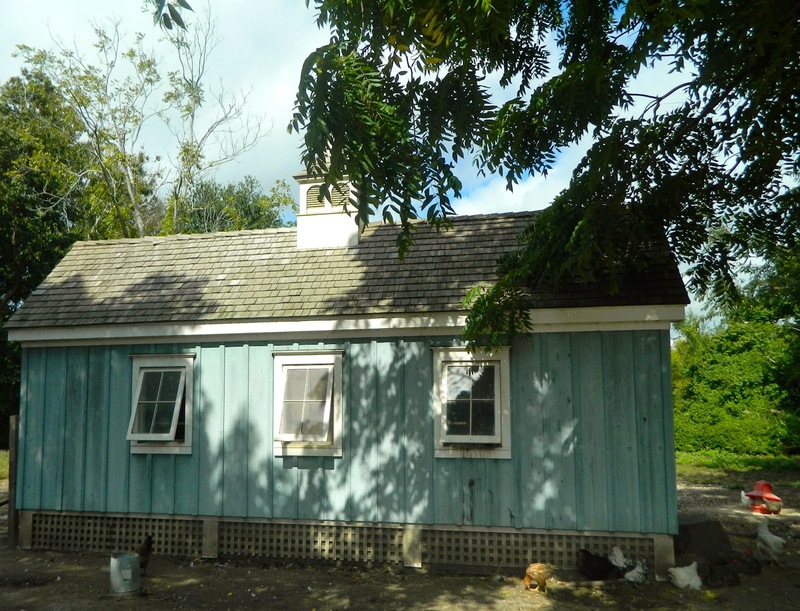 The hens are housed in a pretty blue henhouse, but they have free range of the farm. I wonder which hen laid my morning egg today? 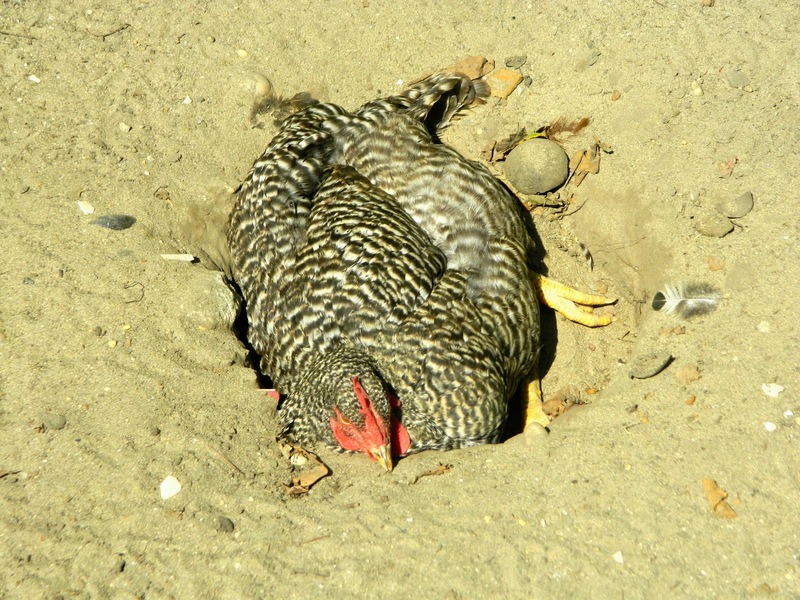 The weather that day was perfect -- not too hot and not too cold -- but this hen dug a hole in the sand in which to cool off. 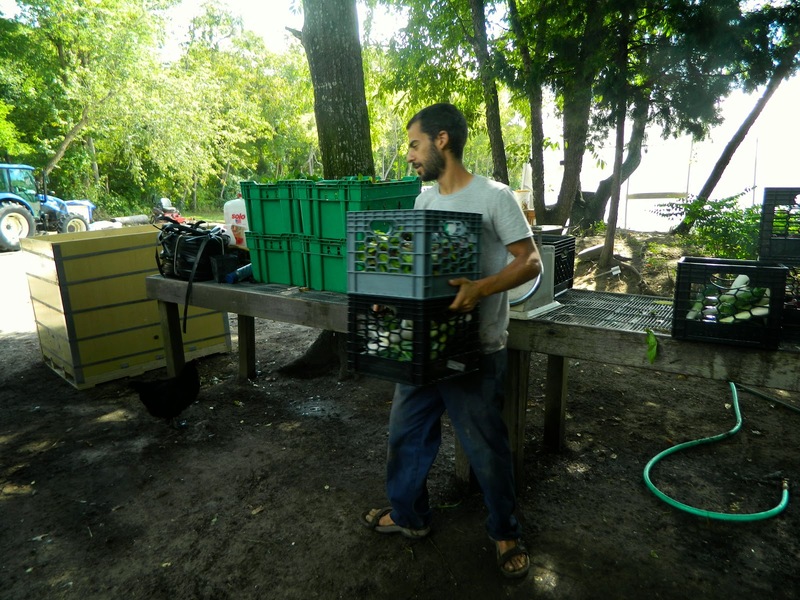 We were fortunate to meet Ali Moussalli, the head farmer at Beach Plum Farm. Ali was loading a truck with hand-picked fruit and vegetables which he then delivered the short distance to their restaurants. Depending upon what is available, the chefs develop their daily menu specials. Ali gave H.H. 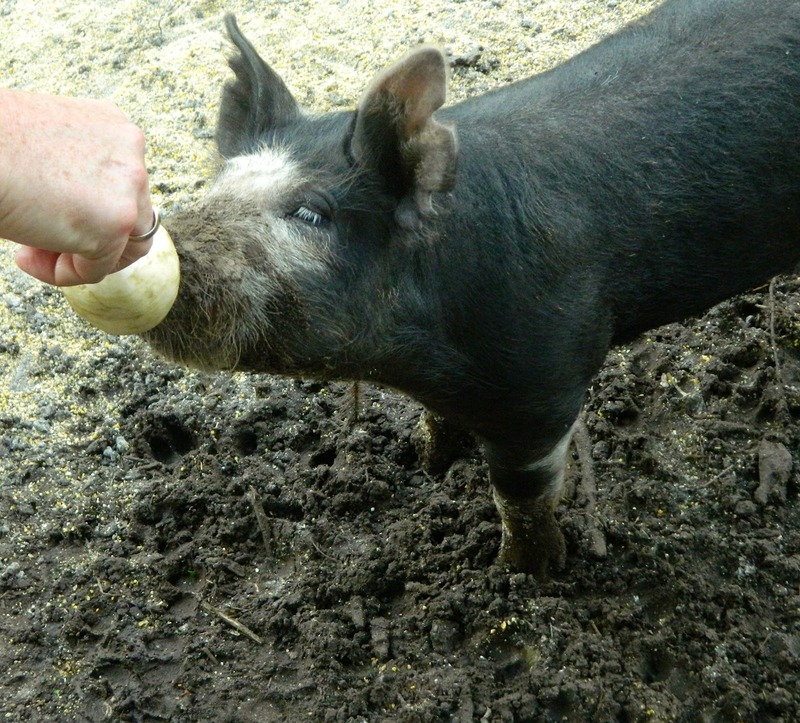 a turnip to feed to the pigs. We found more pigs and other livestock when we walked to the north end of the farm. The road led through a marsh. It was a beautiful walk. No cars are allowed on this road. 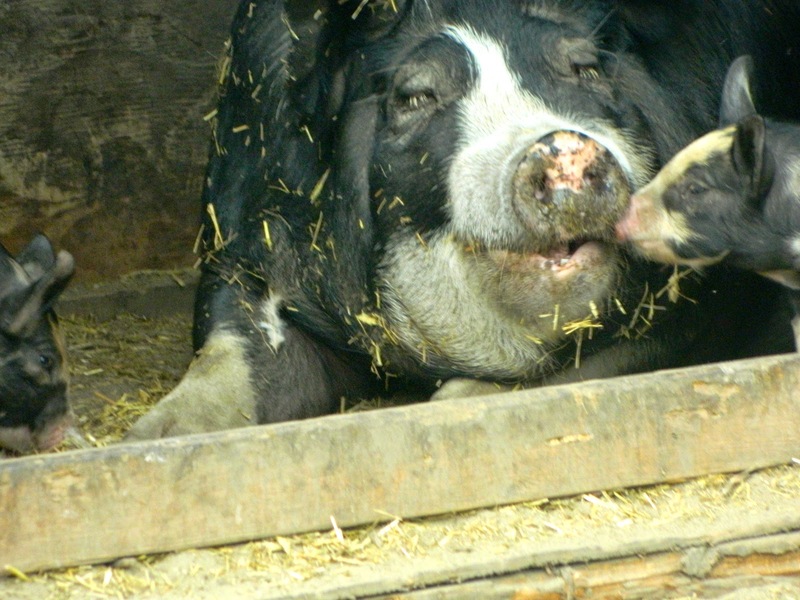 This fat momma had an adorable litter of piglets. 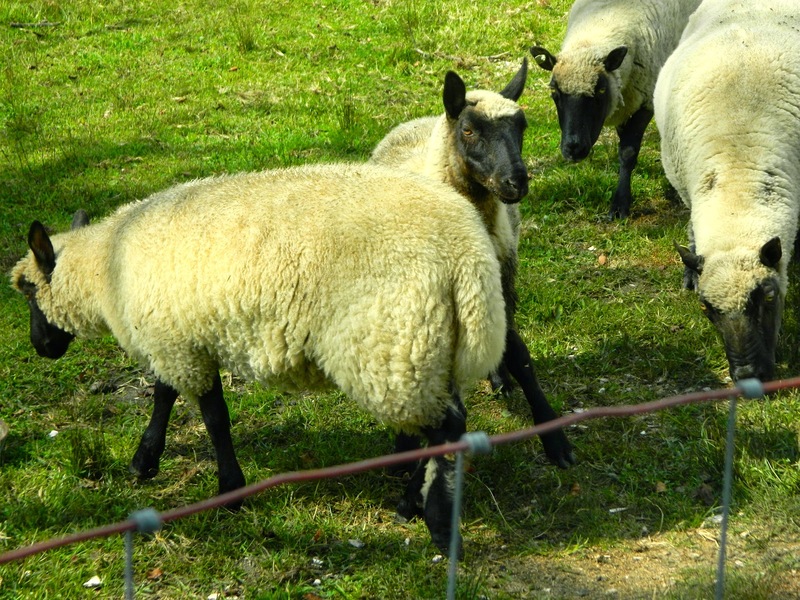 The sheep weren't too interested in us when they realized we had no food for them. We walked for about an hour. Of course, as it was late in the season, we didn't see the extent of the crops. 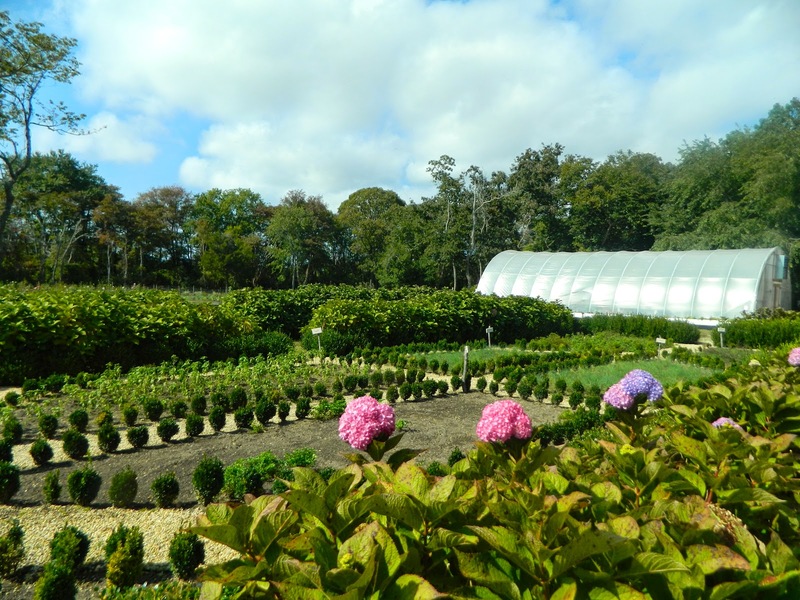 There were 5,000 asparagus crowns, 500 strawberry plants, 700 blackberry cuttings, and 1,000 raspberry cuttings planted in recent years. 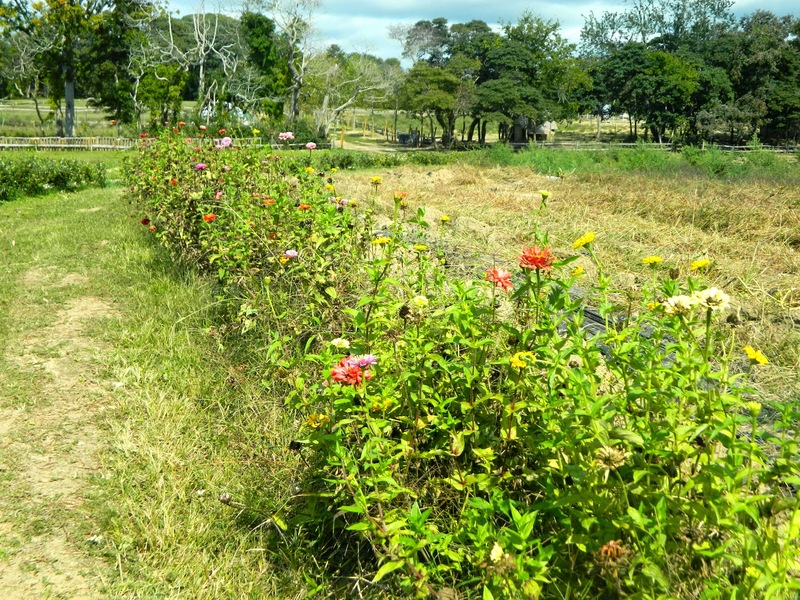 Some of the fields of crops were bordered with zinnias. 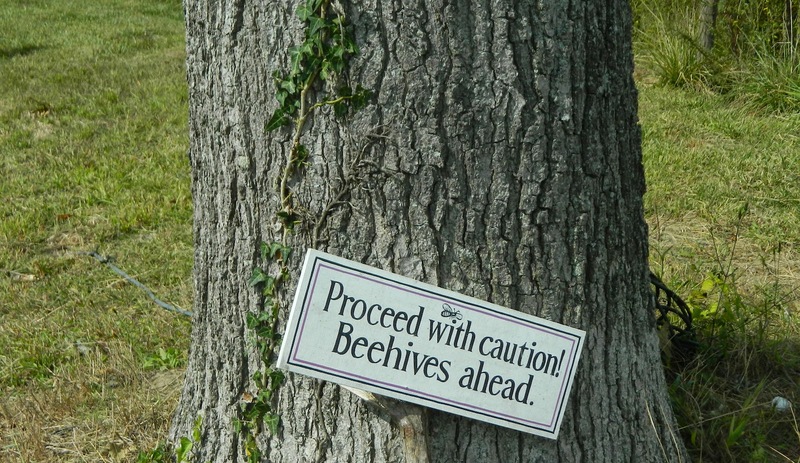 They are much loved by the bees. The beehives are a new addition this year. "They are an incredible world unto themselves. The more you learn the more impossible they sound. 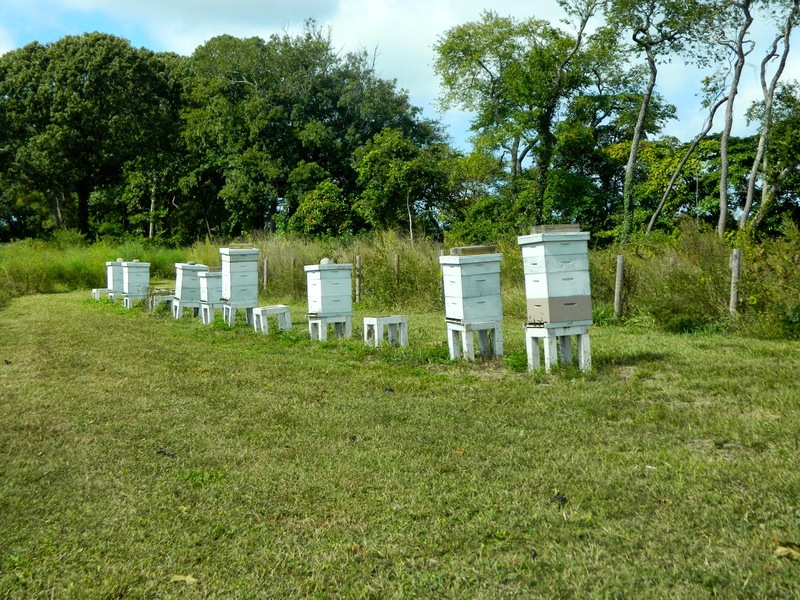 I'm new to harvesting honey so I'm not an expert, but they have this crazy-high consciousness and type of intelligence that is really alien. They are extremely important to the world. I just saw a quote from, I think, Albert Einstein. He said if bees were to die out tomorrow our species would only live three or four more years." 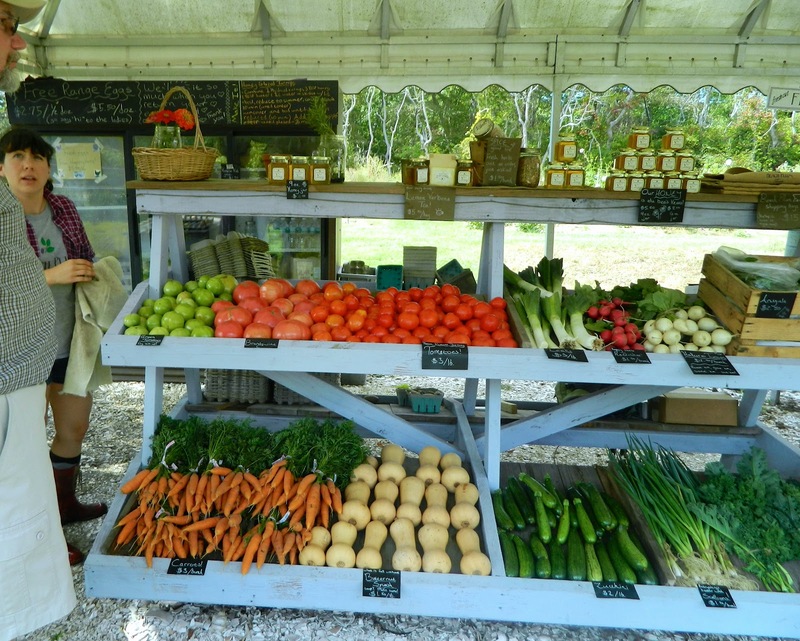 We returned to the farm stand, anxious to purchase honey, before leaving this wonderful place.